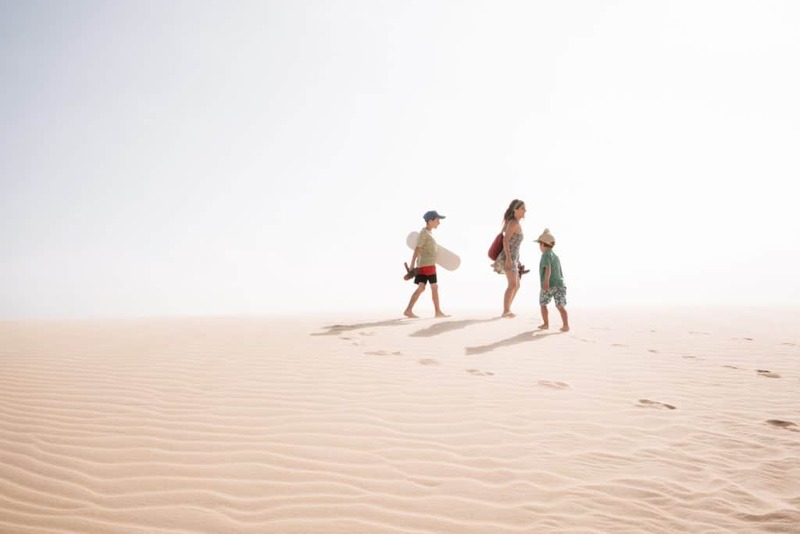 From Valizas, we crossed the ever-changing dunes of the national park to reach Cabo Polonio (El Cabo), where the wind carries the cries of sea lions and where dolphins surf by the shore. Lit mainly by sun and candlelight, the darkness of the night is only interrupted by the rhythmic sweep of the lighthouse beam. 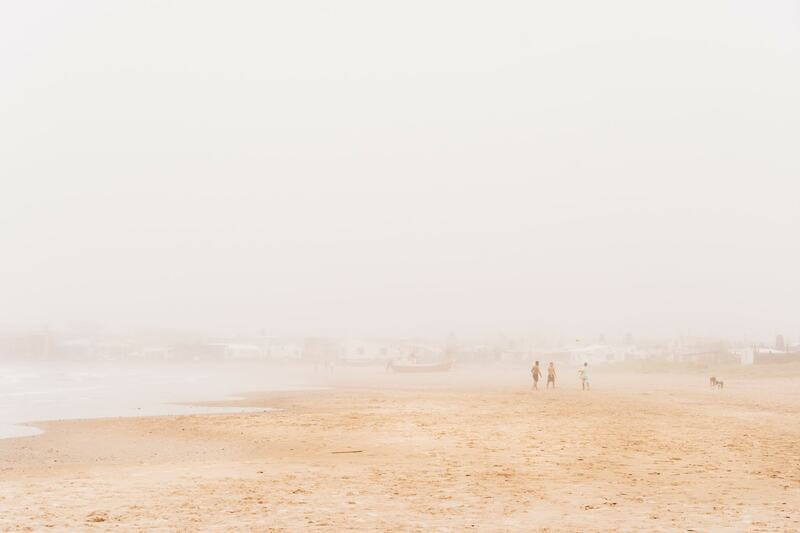 A breezy 2-hour walk brings you off the grid to one of the wildest parts of Uruguay's coast. Read on for details. Distance: 5.1 miles (8.2 km). GPS log. Bring water. 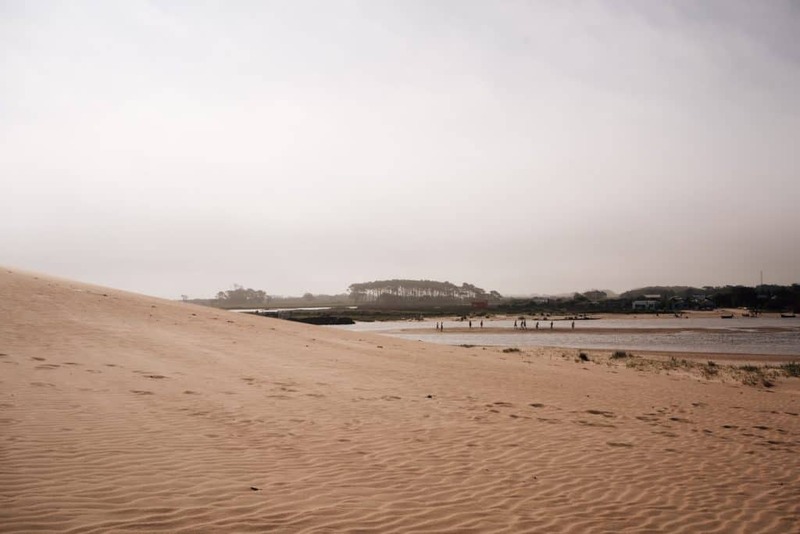 There are no water sources until you reach Cabo Polonio. THE SUN IS NO JOKE and there is no shade. Bring sun protection (sunscreen, hats, etc.) and start your hike early or after 4PM to avoid the effects of the strong sun. Remember that major hole in the ozone layer over the South Pole? Yep. Bring headlamps or flashlights. There's no electricity in town, so this helps for navigating after dark. Bring cash. There are no ATMs. Bring tampons/pads. I don't think I saw a place to purchase these products. Idyllic summer glow of the reserve's dunes. 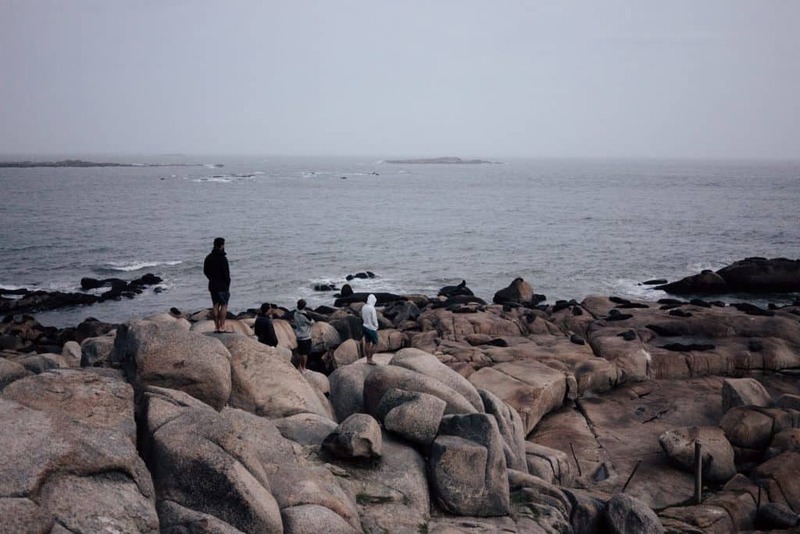 On New Year's Eve, we decided why not start the new year with an adventure to Cabo Polonio? Vincent had visited a few years ago and fell in love with the secluded beach town that was famous for its relaxed atmosphere and lack of electricity and running water. 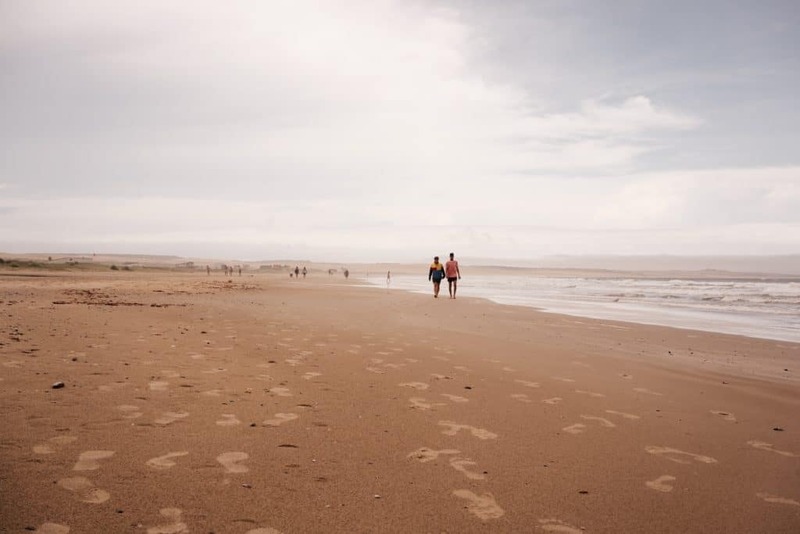 We hastily looked up last minute Rutas del Sol bus tickets and lodging options, but it seemed like the odds were stacked against us — in the recent years Cabo Polonio had become a popular destination for Uruguayans, Brazilians, and Argentines and we were entering the short peak season. None of the bus tickets to Valizas could be purchased online and we couldn't reach them over phone. In a last-ditch effort, we headed to Terminal Tres Cruces in Montevideo to see if we could buy tickets in person since we had heard that sometimes they issued standing tickets when seats were sold out. As luck would have it, we were able to buy early 6 AM tickets to Barra de Valizas from the ticket counter. Apparently, you can only buy early January tickets in person since they're in such high demand. With the station wifi, we booked the last available Airbnb and crossed our fingers hoping we would have a place to stay. A two to three-hour hike. Wait for the next bus to take you to Cabo Polonio's visitor center and take the 4x4 truck to bring you to the beach town. 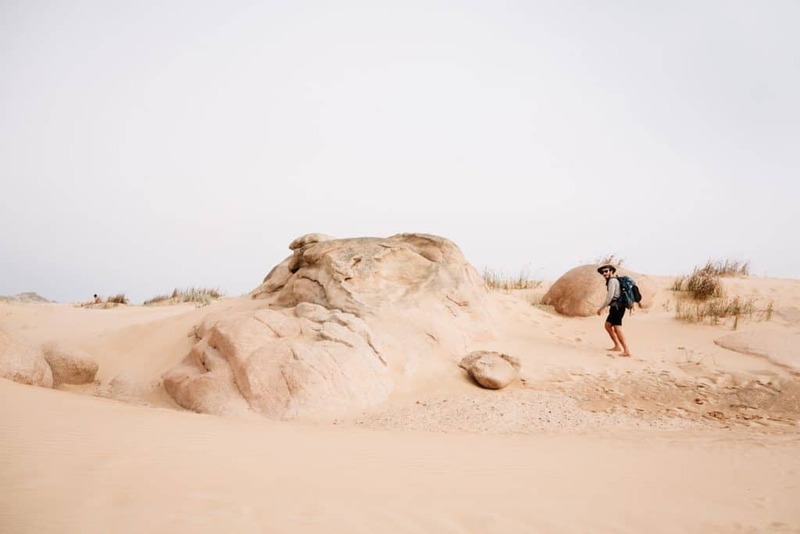 If you don't want to hike, you should actually buy a Rutas del Sol ticket to Cabo Polonio, not Valizas, this would remove this extra step. Face the tough competition and hitchhike to Cabo Polonio's visitor center, then take the 4x4 truck. The last option was the least appealing, it required a walk back to the main highway, stiff competition and also at midday there likely very few cars headed that way. We decided to head to Valiza's beachfront cafe La Proa to grab a bite and think through our plan. In this area, the must-order is Buñuelos de algas, which is essentially super crispy and DELICIOUS seaweed tempura. We hung out there and then people watched for a few hours. Barra de Valizas lends itself to more commercialism because it's reachable by car, there was an eclectic crowd of families, beach hippies, and backpackers. By 4:30 PM, the heat subsided and the shadows mellowed, we decided it was time to start our hike (the sun is no joke here so time your hike carefully). 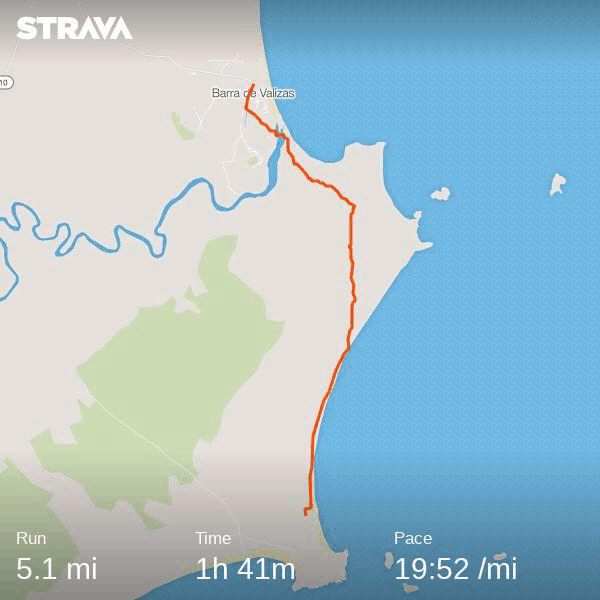 We grabbed a generously proportioned milanesa (chicken cutlet sandwiches) snack from the supermarket and started on an in-land road that ran parallel to the beach houses. After five minutes, the road opened to an expansive view of the river crossing that we were warned about. It was completely different than what I imagined, it looked more like a yawning sandbar rather than a river that fed into the ocean. Kids played in the middle of it and people crossed it at all different points, with some areas deeper than others. Here you have two options, you can pay for a riverboat to take you across for a small fee. Or you can do what we did, hike up whatever you're wearing, hold your backpack over your head and cross. Some beachgoers helpfully pointed us to the shallowest section, and while the water reached my chest in some areas (I am short), the water was lukewarm and gentle, making for an easy crossing (nothing like the High Sierra's river crossing I had braced myself for). Once we padded ashore the dunes seemed to stretch on forever, only punctuated by the ant-like people playing across its surface. Here you can go as the crow flies, cutting straight across the dunes for a shorter route, or you take a longer route that hugs the coast. 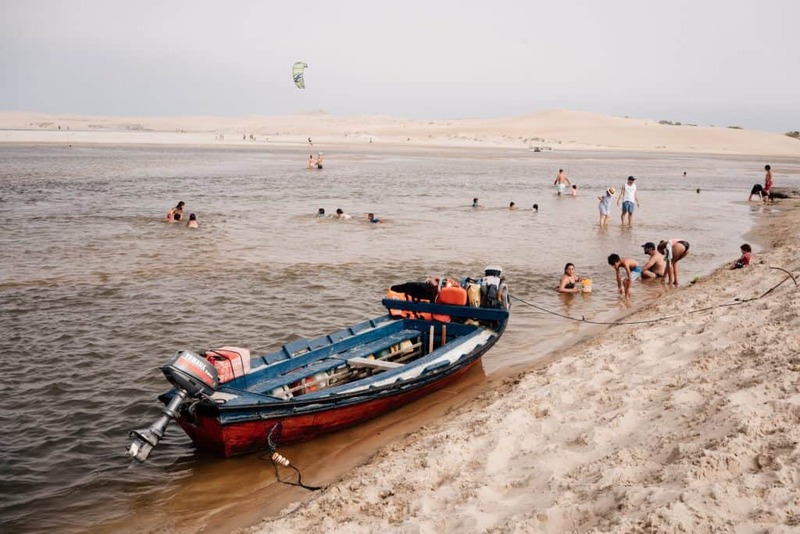 I recommend the former, as it gives way to a diverse landscape and gives you a chance to explore some of the tallest dunes in South America (there are literally sandboarders that come here)! Also, as long as you have Google Maps or some sort of GPS or make note of where your shadow is — it's not so expansive that you'd get lost. After some time, you will see Cabo Polonio's famous lighthouse in the distance, making it an easy beacon to follow. Looking back at the river from the top of the dunes. This is pasto dibujante, a.k.a. cartoonist grass, named for the drawings it etches in the sand. As we hiked, the wind was literally wicking the sand off the dunes, casting a dreamy glow and quickly covering up each step we took. Here they call them 'dunas móviles' as they seem to have a life of their own. It was only at the top of the dunes when I realized how unique the landscape was, to our right was a stretch of sand that crept into the river and beyond that a grove of trees. The path ahead of us resembled a Martian landscape, with moon rocks submerged in the sand. We went barefoot as long as until we hit the swamp-ish looking grounds that had some thorny plants. It was here that I RANDOMLY felt this shooting pain in my arm and looked down to see a windswept wasp that had landed in my arm stinger-side down. This sucked, but for some reason was more funny than painful and it was better than the time I fell on stinging nettle in Peru. 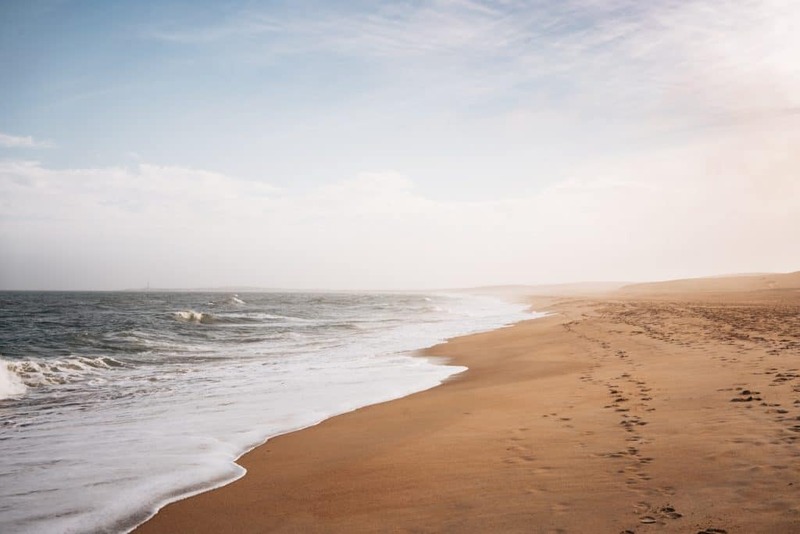 After a certain point, it became easier to walk barefoot on the tightly packed sand by the waves. Here we began to see the occasional sea lion carcass. 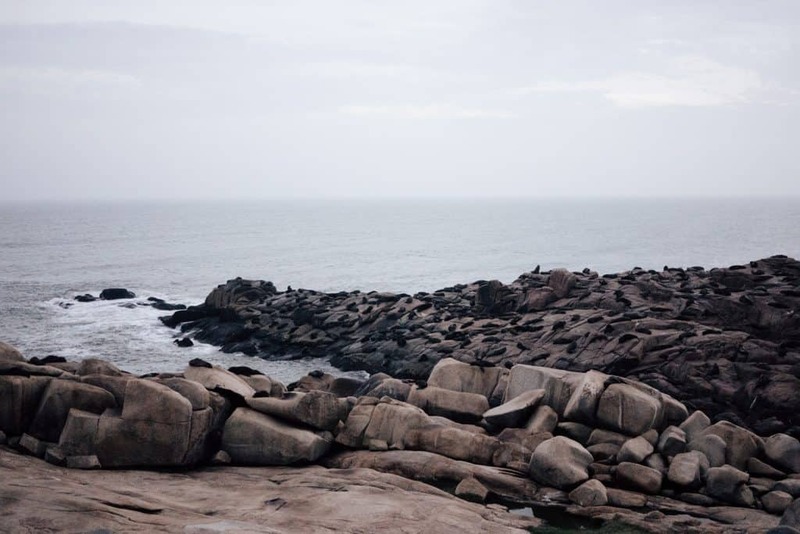 South American sea lions and Patagonian sea lions have flocked to El Cabo, taking up residence by the lighthouse, and their wails can be heard throughout the town. Can you see Cabo Polonio's lighthouse on the far left? Two hours later we neared the town, our place (which is unfortunately no longer on Airbnb) was one of the first houses we passed. The house had a structure for aerial silks and felt simultaneously more luxurious than people had described for what you'd find in El Cabo, but also basic for a $95/night room. We had a bedroom and bathroom light and a communal shower that gave warm running water (all connected to the electric generator). 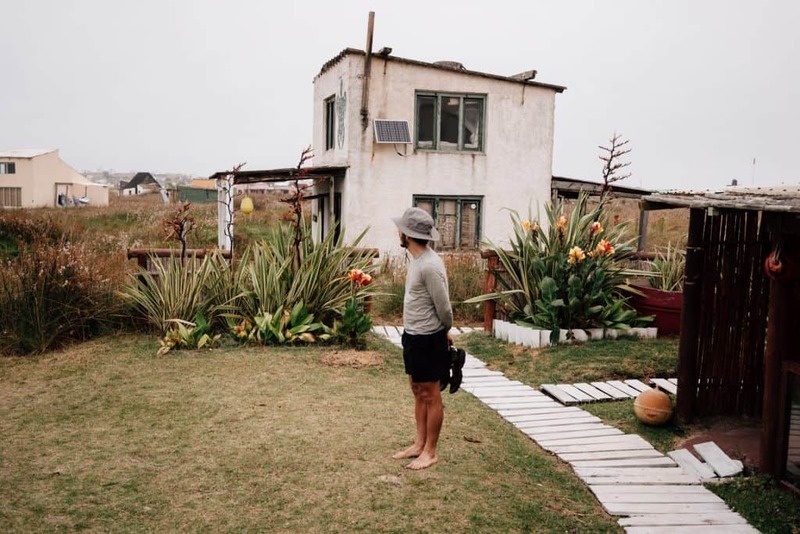 El Cabo's reputation preceded it, people described a raw landscape and idyllic hippie commune of sorts that was marked by no electricity and no running water — the perfect place for people looking to get off the grid. Some of this was true, time felt slower, untethered horses meandered gently through the meadows, dolphins played by the shore, people walked barefoot to centro, and nightly paths were lit by candles in wine bottles. At the same time, it was also becoming increasingly hip and bohemian-chic, there were pricier restaurants, fashionistas that wore Missoni to the beach, and vegetarian restaurants (surprising for a small beach community considering that Uruguay is after all the world's biggest beef consumers). When I think back on it, I don't think we really did anything, which was the point. Lulled by the waves and pace of town our day of lounging was punctuated by eating, reading, and walking. I imagine it'd be the perfect place for a writer to retreat to. Perhaps the most daunting task was finding wifi to figure out if Vincent's plane was leaving the next or following day, in which a posada owner kindly lent us her mobile hotspot — otherwise, don't expect to have access. You can see the sea lions so close! They are called 'lobos marinos', which means sea wolves (not sea lions). It feels like a more accurate name when you hear their howling. Back in the day sea lions were hunted for the skins, now they are free to chill out on the rocks. The most exciting moment was a relentless tropical storm that swept through and caught us at the bus station. Strangers alike huddled together for shelter and at the end of the day we ran back to our place blinded by the rain and crashing through huge puddles. My favorite treats were getting the handmade alfajores de maizena and ginger squash tamales from the supermarket. The days we went were misty and windy so we didn't go swimming, but there is apparently a "surf side" and a "swim side" of the beach for El Cabo. I'm not sure which is which, but for reference, the northern Playa Calavera (named skull beach — legend has it in 1892, the Brazilian battleship Solimões was shipwrecked and the bodies of 123 sailors washed ashore) is marked by two fishing boats on the shore, and the southern Playa Sur is where you go to see sunsets. We didn't see any surf rental places near Playa Calavera, but for those who bring their boards, it's apparently normal for sea lions to surf alongside you! To do the 2-3 hour walk, book a morning ticket to Barra de Valizas from Rutas del Sol from Tres Cruces bus station in Montevideo. To get to Cabo Polonio by car, book a bus ticket to Cabo Polonio instead and take the doubledecker 4x4 truck to the actual town. IMO the hike was the highlight of the trip. You can get the best of both worlds by hiking there and taking the truck out. Note, there is a Rutas del Sol booth in the town of Cabo Polonio so you can buy and modify bus tickets. I don't believe you can camp on the beach and lodging fills up pretty quickly due to the short season. There are many hostels. El Cabo is pricey — expect~ $90/night for a private room. Words and photos by Vincent and Jocelyn. Follow our latest adventures on Instagram. 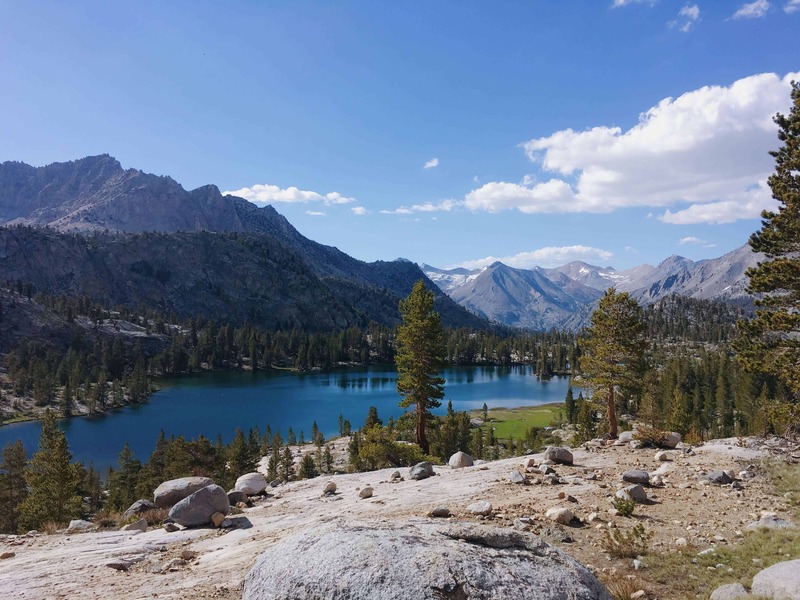 The 42-mile Rae Lakes Loop in Kings Canyon Sequoia National Park, is for some, the definition of type 2 fun. With bears, rattlesnakes, mosquitos, a glacial pass, and washed out bridges there was never a dull moment. 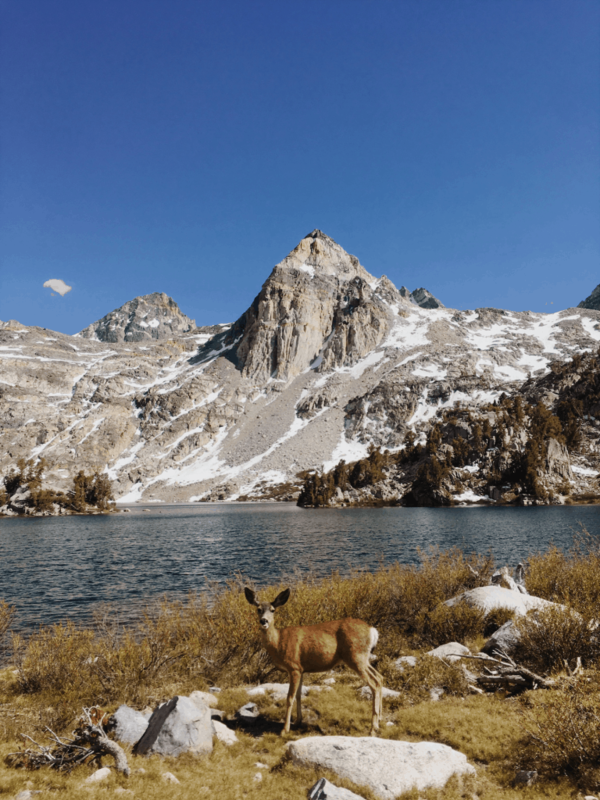 Though, these are the same unforgettable views that inspired Ansel Adams and John Muir and might just be worth the adventure. Duration: 2-3 nights (~14 miles/day or 10.3 miles/day respectively). When: Late spring or early fall (we went June 11th). Difficulty: Hard (early season), Moderate (late season). Direction: We recommend counterclockwise, read on below to see why. Wilderness Permits are required. You can reserve it 2-weeks in advance, but they also have ten first-come-first-serve day-of permits starting at 1 PM at Road's End ranger booth. Bring a mosquito net and bug spray. They are relentless and will swarm you. You need a bear canister. Luckily these are available for rent at the ranger station at the trailhead. For those ULW junkies, they also have carbon fiber ones available for rent at a higher price. You can return it at the collection site whenever you finish. 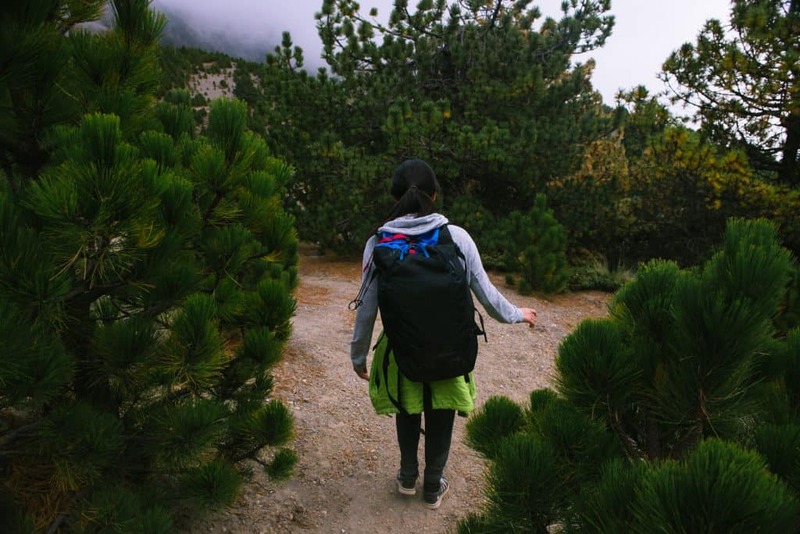 Wear long pants - these come in handy for many reasons: avoiding mosquitos, less risk of snake bites, and warding off ticks from the heavy brush. Water filter - there are plenty of places to refill! Sun protection - There are many spots where you have persistent sun exposure. At Glen Pass this is magnified by high elevation and the snow. NPS has a great breakdown on campsites by distance. We went to the ranger's station at Road's End hoping to score a walk-in permit for Rae Lakes. By the time we decided to do the hike, it was too late to reserve online (2-week minimum), so we made a point to arrive at 1 PM — the earliest time permits were being issued. Luckily they not only had availability, but they also had bear canisters available to rent. Also, we were happy to learn that the marmot stowaways were less of a problem in this region of the park, so we didn't have to wrap up our car. We decided to go counterclockwise, namely because l like getting over the climb earlier than later. The hike opens with a sandy trail, which soon fed into a wooded area. The wooded area had several areas that were recently charred and still smoking, but to our relief, there were signs that indicated that these were "controlled fires." After crossing a wooden bridge, we had to figure out how to cross Bubb's creek. It took some trial and error (unnecessary bushwacking and log crossing) to find that the best place to cross is further on the path east, where you'll spot a crossing with some strategically placed stepping stones. 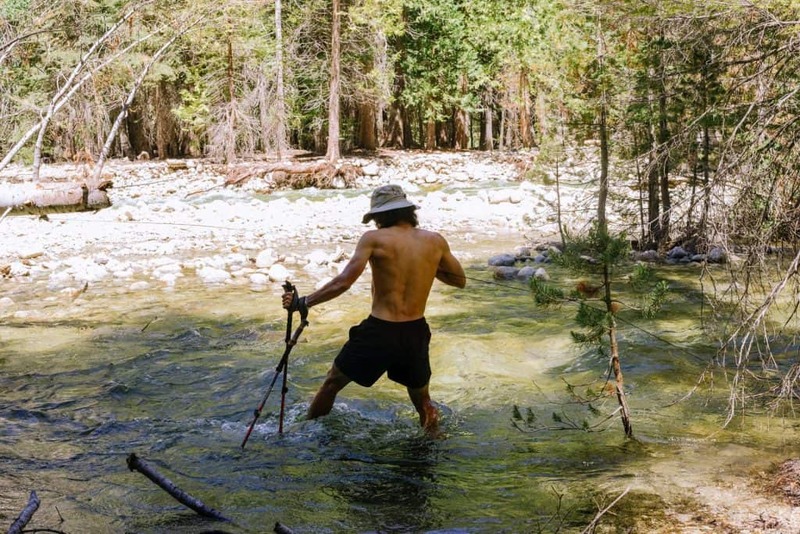 Here you can cross with the help of your poles without even getting your feet wet (💧Also a great place to fill up for water). 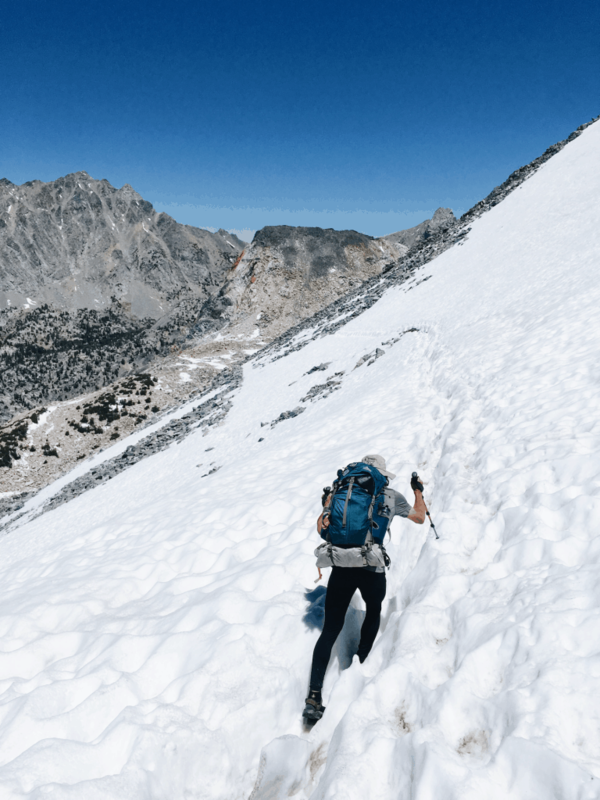 Later in the day, the terrain opened up into a steep rocky sun-exposed climb. Emboldened by our fresh trail legs, we were walking particularly fast until we startled (and was in turn startled by) a two-foot-long rattlesnake that rattled at us before darting away. A passerby clearly had this on his mind, warning us, "watch out there are rattlers!" without stopping for a breath. Normally, the snakes dart away feeling the vibration of your poles, but be alert and examine crevices around anywhere you decide to take a rest. Soon after the exposed ascent gave way to a cool wooded area, which gave us relief until a bear bounded across our path a few feet away. We instinctively started our bear dance complete with hiking pole moves. This dance was hilarious now that I look back on it. I am only 5'1" so trying to "look big" is tough and comical - the bear considered us from a distance, most definitely weirded out, and just kept walking without turning back. ⛺ We camped out around Junction Meadow near another solo camper. 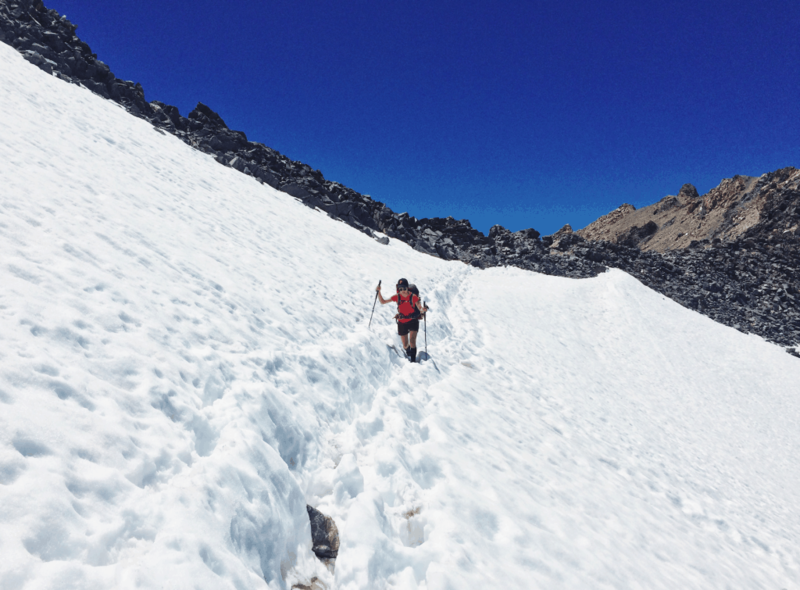 While we were excited to cross Glen Pass today (elevation 3,651 m, 11,978 ft), we heard so much contrasting advice that it was a bit hard to figure out when to cross it. Some told us to hit the pass early, to enjoy the benefits of stiff snow without post-holing, while others said later was better so that the snow wasn't icy and slippery. We ended up crossing around 1:30 PM, which in our opinion worked well with our hiking poles. The view from the pass was stupendous. We were flanked by craggy peaks, glacial lakes, and snow, but it was also windy, so we soon started downhill. We didn't see a single soul other than some birds and a chipmunk running in the snow. After crossing the pass, we were now going downhill and everything felt like a breeze. However, the mosquitos did become increasingly abundant, perhaps due to the number of lakes. Dollar Lake was particularly bad. Some of the clockwise hikers we met seemed to be plagued by the mosquitos — perhaps another reason to go counterclockwise (you pass through the "mosquito-lands" at a faster downhill pace). The mosquitos were probably the most intolerable aspect of the hike, and ultimately the reason why we shortened our hike to three days, instead of four. One hiker we met exasperatedly said, "I just want to get out of here." 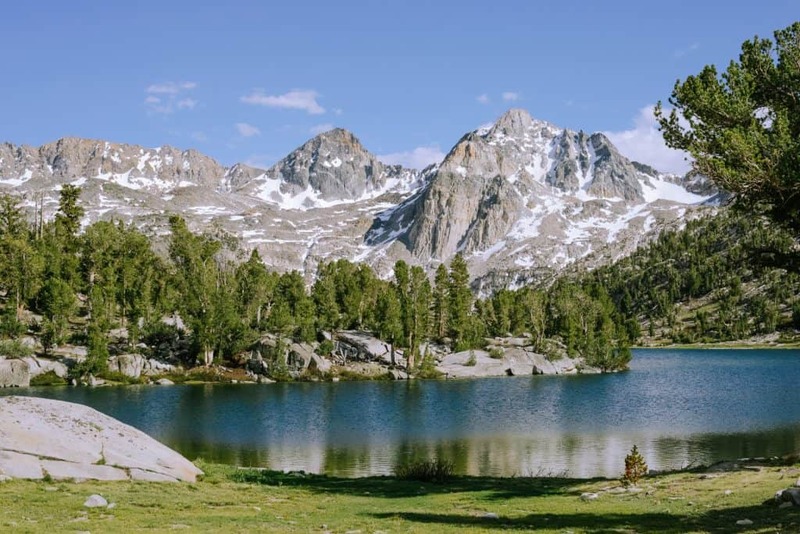 ⛺ We camped out on a high outcrop a little beyond Dollar Lake. It had an expansive view and a breeze that kept some mosquitos away. At night, excited to see the stars, I opened our tent and to my shock saw the third bear of the day a few feet away. Thankfully it seemed to mind its own business and we slept in peace, even the bear canisters were undisturbed when we went to check them out in the morning. The most dramatic part of our last day was crossing the south fork of the Kings River. South Fork Kings River Bridge washed out and won't be replaced before 2019 (see latest trail updates). Earlier, our ranger had warned us to not to take the river crossing lightly — people have died while trying to ford this river. 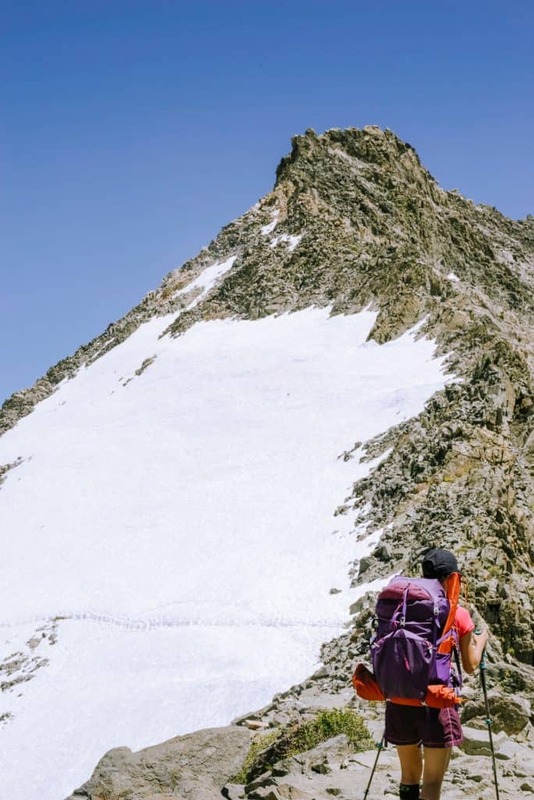 Before crossing unbuckle your backpack chest and waist straps, this way if you're swept into the current you can easily ditch your bag — giving you a higher chance of surviving. Properly stow your things and waterproof them if possible, and cross with shoes on. Luckily, as we were assessing where the best place to cross was, we saw another solo hiker across the river. We shouted intel about our respective sides and worked together to decide where to cross. After settling on an area we started wading into the freezing water. The rapids were strong, people might have easily been swept away with one miscalculated step. 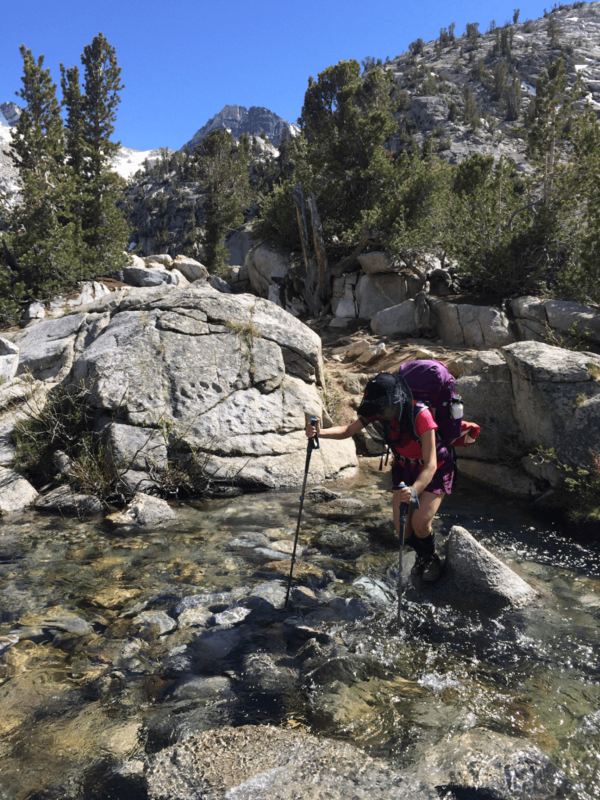 Hiking poles were helpful for bracing against the current and testing the depth of areas. Halfway through the crossing were two overturned trees, we walked across the first one, but had to climb over the roots of the second one to pass it. At this point, we met the other hiker coming from across the way and helped each other hold hiking poles so we could use our hands to clamber up the tree. We bid each other luck and did a victory dance after both parties reached solid ground on the other end. We bushwhacked for a bit to the trail path and took a break to dump the water out of my shoes. Why did Vincent attempt the cross the river shirtless, only he knows. After some time the trail opens up into exposed rock for some time. Gradually we came across a blissful meadow, then roaring falls, and then one of the most epic views into the valley. Finally, it converged onto Kanawayers trail back to the parking lot, where we sped off to celebrate with an In-N-Out burger. The burgers were delicious. 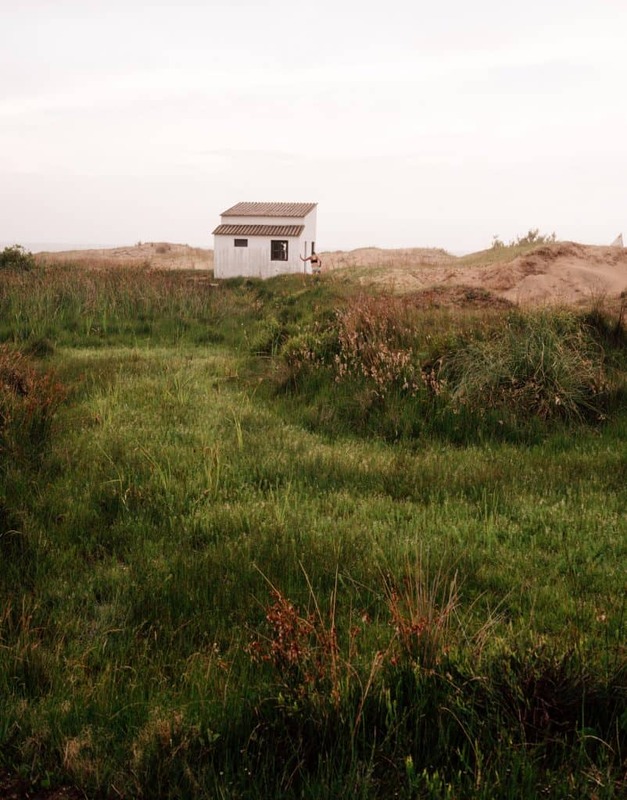 Photos and words by both Vincent Ribeiro & Jocelyn Chuang. Follow our latest adventures on Instagram. Some nights, home is where you park the car. Other times, we've been lucky enough to be invited by others to make their home our home. I've woken up to cold mornings warmed by the coffee Vincent has prepared. Woken up to cuckoo clocks, to the warmth of our car's seat warmer, to a gushing river, to the drumming of rain, in a former fish-factory-turned-hotel, to mornings too cold to leave the cocoon of my sleeping bag. I've gone to sleep under a sky illuminated by northern lights, with the purring of a cat, paranoid in a gas-station parking lot, or in complete darkness – unsure of what landscape I would be waking up to. 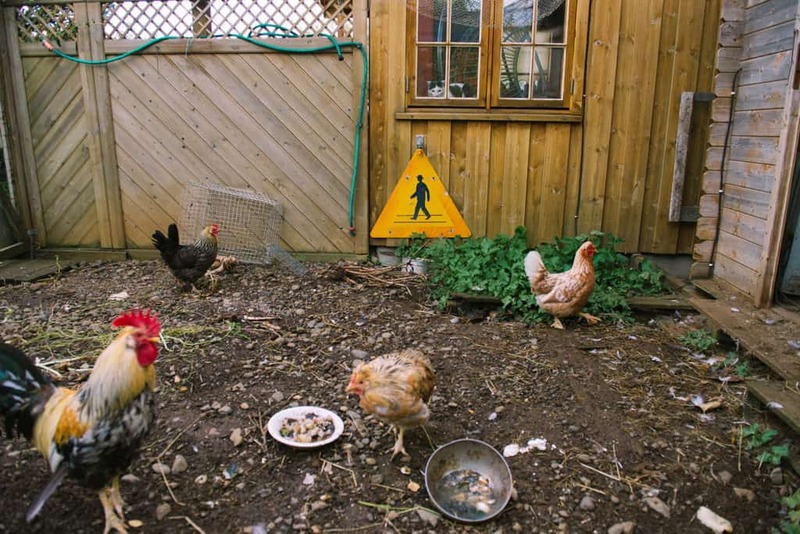 At Gudrun's place, we woke up to rooster calls backed by the chimes of cuckoo clocks. Her cat Frosti was already up on his favorite perch, watching the chickens from the window. The rooster didn't seem fazed, and as if sensing our assumptions Gudrun corrected them, "Frosti's afraid of that rooster." For breakfast, she fetched fresh eggs from the chicken coop and vegetables from her garden — not an easy feat considering the harsh weather as we entered fall. She mentioned that for dinner, she planned to cook the Arctic char her son caught. Frosti turned around to look at us expectantly upon hearing the word fiskur, Icelandic for fish. Frosti scheming from the window. The walls of Gudrun's house are adorned with drawings and art from friends, her bookshelves are brimming with her favorite books, books she translated, and books she wrote. To my delight, there is no dearth of photo books. To page through her photo books is to see Iceland rendered in a new light. The landscape we visitors are so spellbound by are rendered secondary by local photographers since they wake up to this grandeur every day. Instead, they grasped onto traces of humanness — the light trails of cars and synthetics. Others, as if challenging the grandeur of the landscape, shot inches away from mountain-faces. What is typically ignored in my line of sight is joyfully rendered anew. Yet some things never get old. 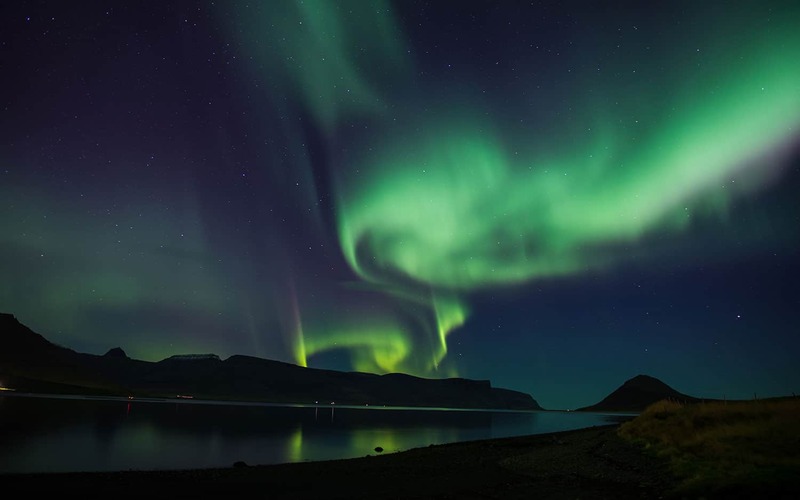 To Gudrun, the northern lights were a phenomenon that never ceased to excite her. Each night, she checks on the northern light report and reports the predictions. That night she excitedly shared that we were entering a good week for northern lights - clear skies with a high chance of lights. Gudrun lives life with the spirit I hope to possess at her age. After a dinner, we cleared the table of plates and replaced it with a sprawling map of the island. She pointed at the highlands, an area impenetrable for our car, and recounted her trip biking and rafting through the area. 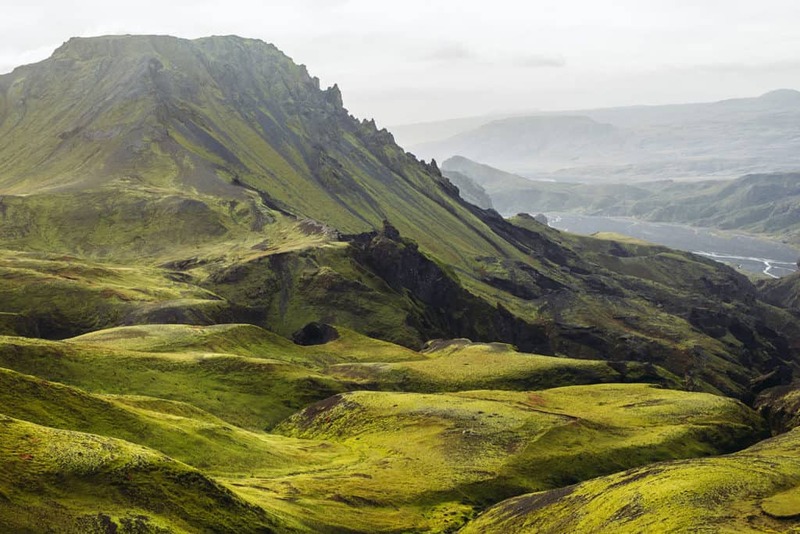 We struggled to imagine the sheer magnitude of that experience, as we had emerged wide-eyed just from hiking Fimmvörðuháls which only touches the fringes of the highlands. These days, Gudrun is volunteering at a cabin in the middle of the highlands in the extreme isolation and perils of Iceland's harsh winters. Nearly nobody ventures into the highlands at this time of the year. Yet, she tells us that she is entertained by the company of three crows and the tiny house mouse that seeks refuge in her cabin. Sometimes when I want to return to the peace of Gudrun's home, I put on Ásgeir's album. Gudrun loved to play the tracks of her old neighbor along with other tracks from local Icelandic artists. That night we eagerly stayed up looking into the distance from our attic room, yet we see no lights beyond the occasional passing car. The next morning, we semi-reluctantly head out to Þingeyri, as we had grown accustomed to Gudrun's hearth and interesting conversations. Yet while winding through the quiet roads of the Westfjords, it's impossible not to be drawn back into the landscape. There is only one path to take and we follow it to Ísafjörður, where we find our friend Helgi's recommended fish buffet Tjöruhúsið. We took a gamble, as the manager said, "we may or may not be open since the season is winding down" when we called. But to our delight, we see them setting up the tables in the cozy lodge-like restaurant and linger around until they opened up shop. Helgi's nostalgic description of the restaurant already set high expectations and we had planned this leg of the trip around eating at Tjöruhúsið — and yet, we were blown away to the point we wanted to stay another night just to enjoy the dinner again. At Tjöruhúsið, the daily catch determines the menu, a surprise for both chefs and visitors, until the fishermen arrive at the dock a few hours before the restaurant opens. The fresh fish is brought out of the kitchen still simmering on skillets. From there, guests are allowed to help themselves to as much fish as they want — after all, it's a fish buffet. Completely sated by Tjöruhúsið's fish soup and buffet, we drive into the dark, continuing westwards with no particular destination in mind. As we drive further into the night, we begin to see an irregularity in the sky. It's as if there's something tugging on the sky and the folds are giving off a reflection. Yet it's so faint, we're not sure if it's a trick of the eye and can only see it when we take a long exposure photograph. A few minutes later the phenomenon intensifies and by then we're completely spellbound by our first northern lights sighting. The irregularity of the lights movement is bewitching and it's easy to see how it has inspired so much lore around the world. We later found out that fall is a great time to watch the northern lights and that week happened to be one of the strongest periods of northern lights, to the point that the Reykjavik government mandated that all the city lights should be turned off so everyone could enjoy the intense Northern Lights. Falling asleep blanketed by the dancing Northern Lights while car camping remains one of my favorite memories. At 4,340 meters, Nevado de Colima (a.k.a. Zapotepetl or Tzapotépetl) is the seventh highest peak in Mexico and can be summited within 8 hours starting at Ciudad Guzmán. We had the whole trail to ourselves for the four-hour hike and enjoyed impressive views of neighboring Volcán de Colima along the way up. Volcán de Colima has a history of 40 eruptions (most recently in August 2017) and has deservedly earned the nickname Volcán de Fuego — for this reason, it is not hikable. How did we get here? 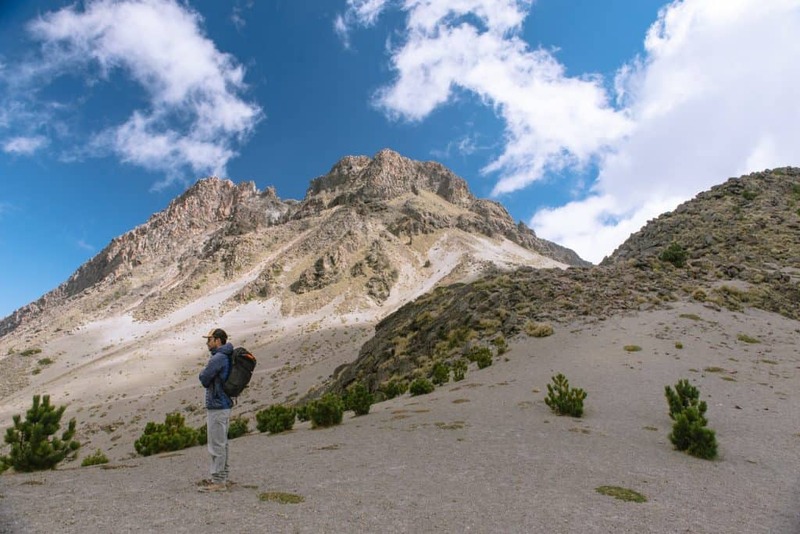 It started with an impulsive late-night decision to summit Nevado de Colima while staying in nearby Tapalpa. 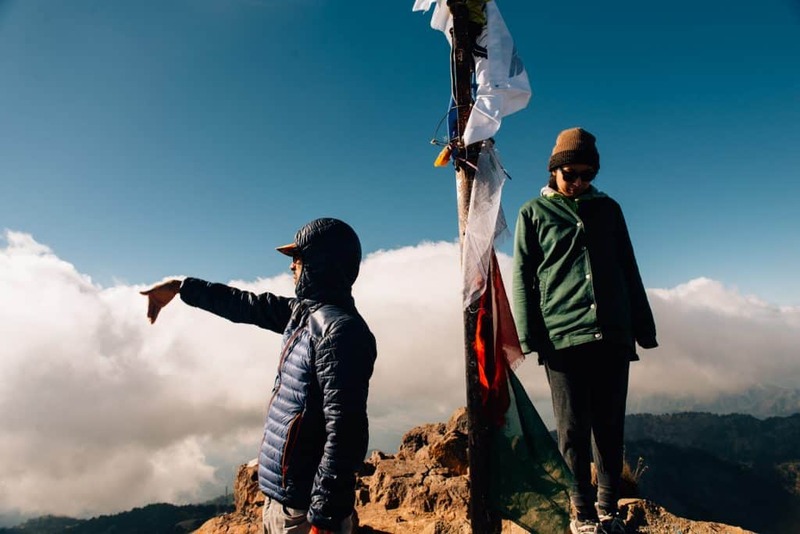 We foolheartedly entertained the idea of hiking the volcano ourselves when we couldn't find enough information online, but thankfully looked into hiring a guide after consulting others in Tapalpa. From there we connected with Gerardo from Nevado de Colima tours who luckily accepted our last-minute request for a hike the next morning. At 10 AM, we met our guide Gerardo at Ciudad Guzmán's town plaza, where we picked up fresh carrot juice and tamales from the market square — and tortas as a lunchtime snack for the summit. While Gerardo has a 4WD vehicle available, he suggested driving up to the trailhead with our sedan. This is doable for someone who knows the road well (in Gerardo's case, 10 years of driving up and down the road), but otherwise, a 4WD vehicle recommendation is warranted. Parts of the mountain gravel road were undependable and at the end, our little car couldn't make it up to the 'official' parking lot and we had to drive down part of the pockmarked road backward to find a suitable place to park. Upon entering Parque Nacional de Nevado de Colima we signed in and pay a small fee of ~30 pesos per person. 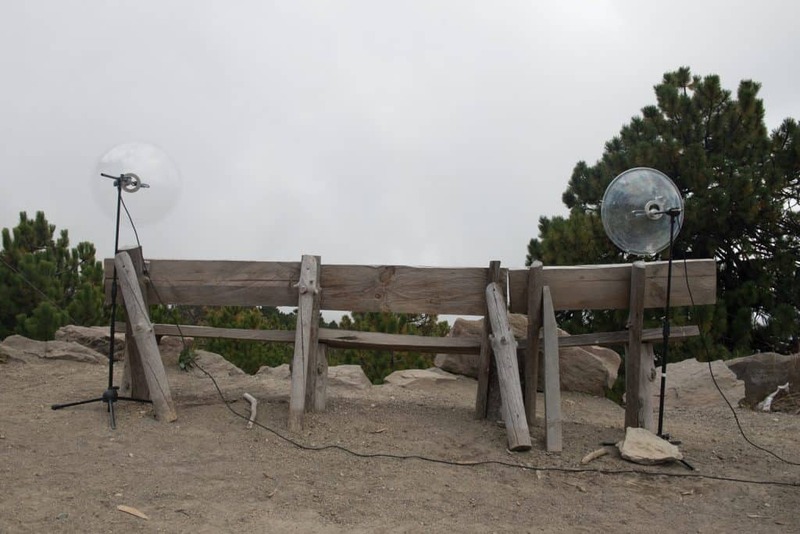 At around 3,500 meters we encountered a locked gate (a recent addition), to which only guides and officials have the key - hikers who attempt to slip by the gate are typically told to turn back if caught by an official. 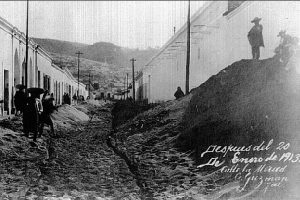 Ciudad Guzman after one of Volcán de Colima's biggest eruptions in 1913. Residents woke up to a layer of ash 15 centimeters thick. Image source. Gerardo studied conservation, eco-tourism, and is also a certified mechanic. As a result, he's knowledgeable about local environmental issues and questions you may have relative to the hike and its surroundings. He and the other residents of Ciudad Guzmán opened our eyes to the tremendous environmental strain that avocados have caused in their area. Because of the hip image cultivated around avocados, demand grows at a remarkable rate of 15% a year. 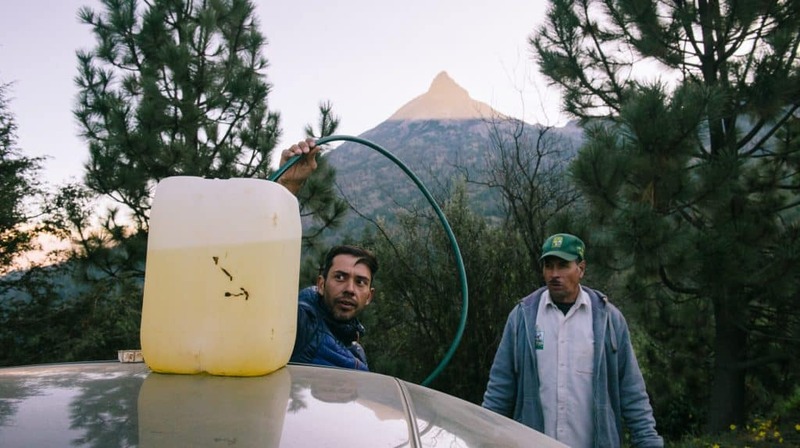 This demand has, in turn, created massive deforestation in Mexico (at a rate of 2.5% a year) and pest fumigation has polluted local drinking water and suspected to be the culprit behind liver issues in the local population. With 40% of avocados being grown in Mexico, the country bears the brunt of USA's market demands. Just another reason why you should reconsider your avocado toast addiction. One of the residents actually introduced us to the chayote fruit, a more environmentally-friendly snacking alternative local to the region. In more optimistic news, Parque Nacional de Nevado de Colima has invested in reforestation efforts, and nurseries of baby fir trees stretch out across the last meters before the trailhead. After parking our car, we walked up to the trailhead near the radio antennas and encountered a group of scientists who were monitoring the sounds of Volcán de Fuego. The area felt tremendously quiet from our perspective, but many of the sounds volcanos make are often below the frequency limit of human hearing, so we bid the scientists goodbye and let the devices do the listening. Seismic devices listening closely to Volcán de Fuego. Entering the brush to the right of the road, we began the hike in a temperate forest, surrounded by juniper and oak-fir. The trees soon thinned out and gave way to moss and zacatonales, marking the start of the alpine tundra. Beyond the entry point, the trail was devoid of signage and we would've likely gotten lost after entering the rocky area where it became less obvious where to walk. Opps look what we got for an extra hour of sleep. The weather is not kind for late-owls. While not a technical climb, more care was required once we started ascending the mountain. I was thankful for the gloves Gerardo lent, as grasping onto the jagged holds made ascending much easier. We could easily feel the effects of the high altitude, as our breaths got shorter, though luckily we didn't experience any altitude sickness (other than a slight headache after the hike). We suspect that staying overnight at Tapalpa (1,950 m elevation) helped acclimate us. Whenever struggling through high-altitude hikes, I remember the advice I once heard in Peru to "breathe deeply as if you were smelling flowers" and continue to power through. Fog and clouds occasionally rolled across the landscape, blotting out our view of Volcán de Fuego — our own fault really, as we knew that an earlier start ensured better visibility, but traded the views for some more sleep. 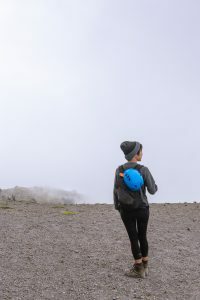 While we read reports of Volcán de Fuego temperamentally exploding several times a day and saw photos of hikers with plumes of smoke in the background of their photos, the volcano was silent throughout our hike. 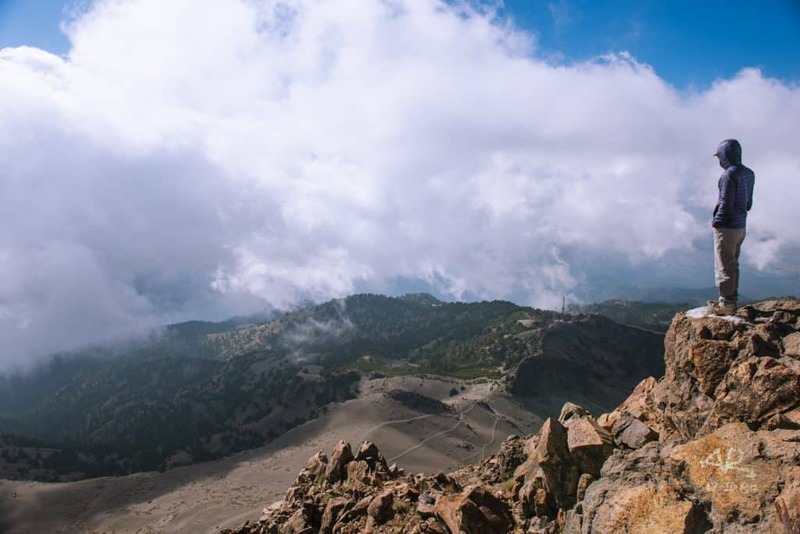 Despite the dry months of November to April being peak volcano mountaineering season, we didn't see a single soul on the trail.During breaks, we simply sat and marveled at the quietude and texture of Volcán de Fuego. Recent lava flows and landslides etched lines into its slope, while vegetation settled into the grooves of lava flows. 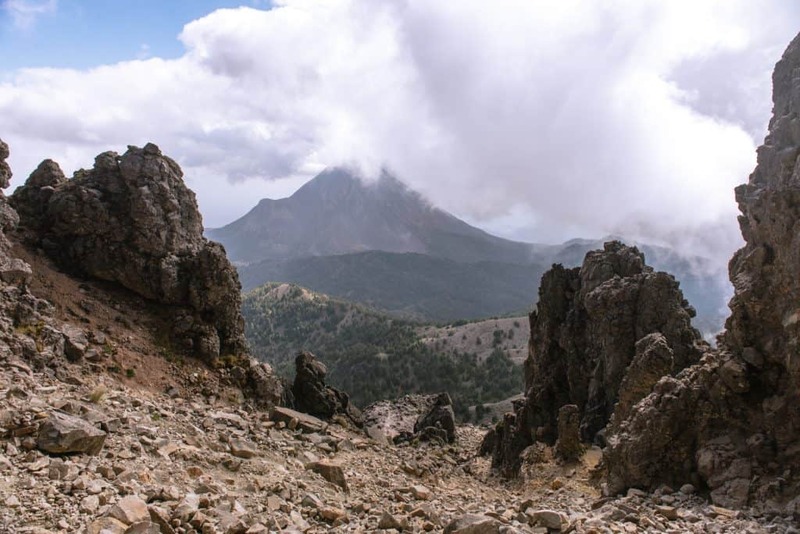 Once we reached the summit we were treated to 360º views of the Colima Volcanic Complex and scarfed down our lunch by the Flagstaff that marked the summit. We sat and rested in the crater of the extinct Nevado de Colima for about half an hour before setting back down the mountain. At the peak, we could see the progress of our 2-hour hike — we started from the antenna on the right! 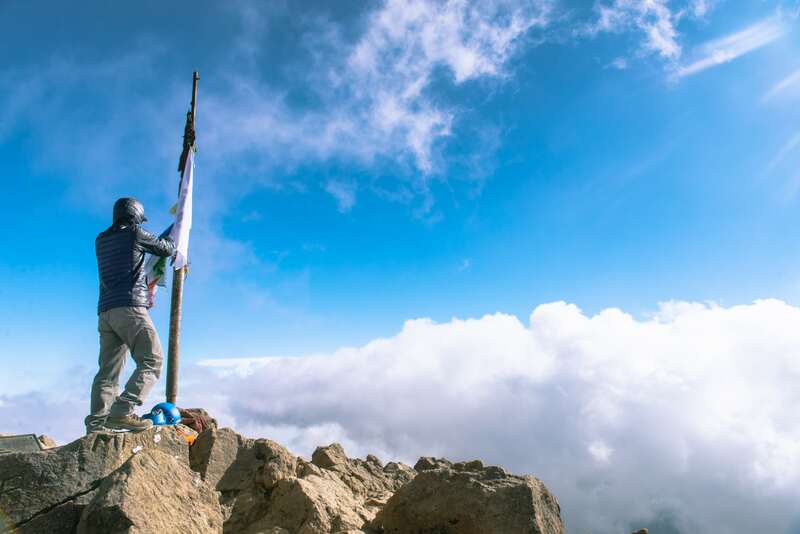 Above the clouds at the summit of Nevado de Colima. Another risk of starting late — you could end up driving down in the dark. Gerardo measures how many hours of sunlight we have left for the rest of the hike and drive down. Going down was way easier than going up, we even dared running down the last stretch of the hill. Walking back to our car, we heard the sounds of woodpeckers and spotted mountain lion tracks in the volcanic ash. Apparently, pumas, tigrillo, and ocelots are all native to the mountain — though not frequently spotted on Gerardo's trips up the mountain. On the way down, we got pretty close to emptying our tank of gas which would have been disastrous — luckily we were able to get some additional fuel from the officials at the entrance gate of Parque Nacional de Nevado de Colima and got back to Ciudad Guzman just fine. We ended the night with an impromptu Thankgiving dinner at a local taco place, filled up from the day's adventure, new friends, and delicious food. 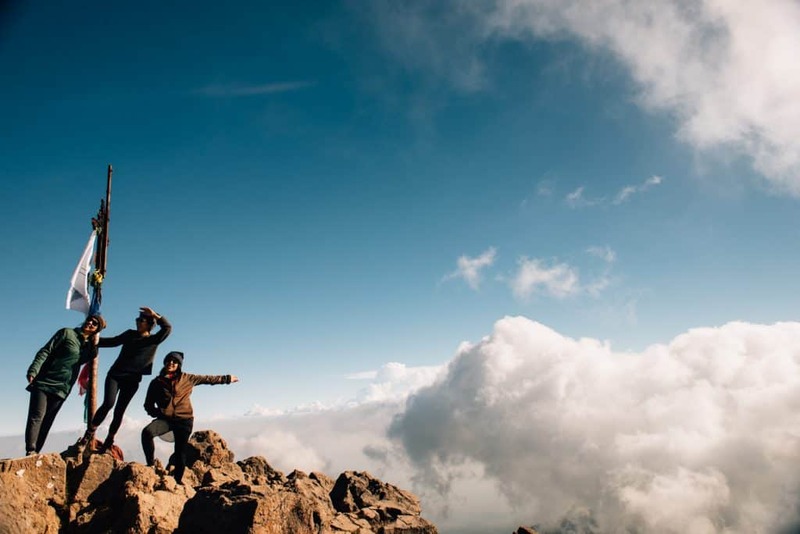 Short way: 8 hour non-technical roundtrip hike - split between a 4-hour drive up the mountain and a 4-hour roundtrip hike. 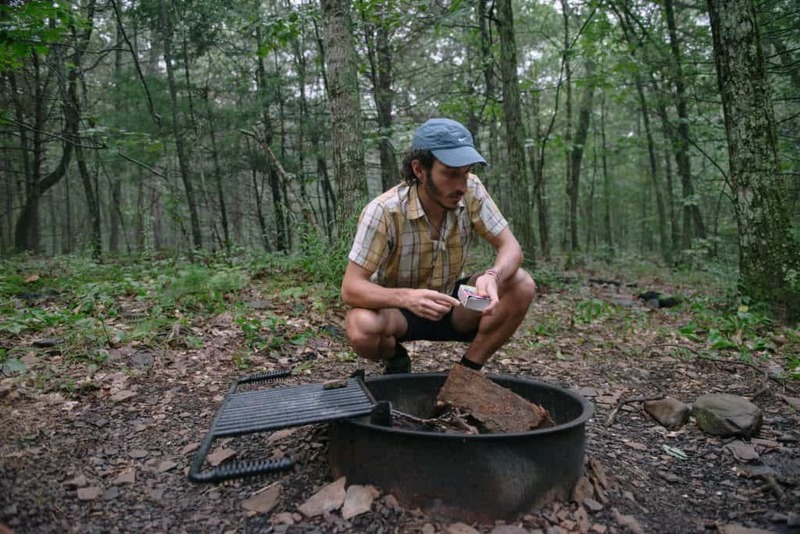 Long way: 3-day roundtrip thru-hike. More information can be found here. Temperature transitions from hot to cold (70º F - 30º F in November) depending on your elevation and the shade — so layers are key. Nevado means 'snow-covered' for a reason, so prep for snow in the winter months. 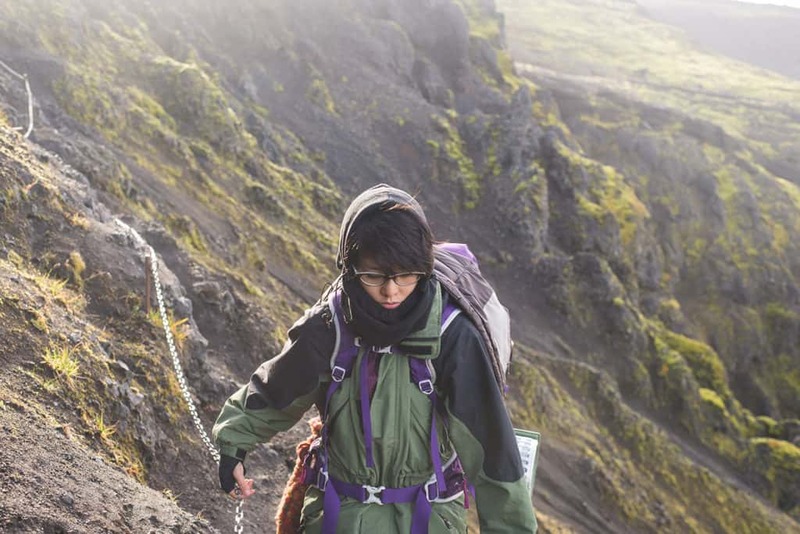 The terrain comprises of volcanic ash, so hiking shoes are ideal (but it's doable in sneakers!). Gloves are also helpful, as you'll often be grasping onto rocky holds as you ascend and descend. Gerardo, our guide, helped provide helmets as loose rocks from the sandy terrain can get dislodged as you ascend and descend. Best months for climbing are the dry seasons of November through May. Start your hike in Ciudad Guzmán with a guide like Gerardo, since it's actually closer to the base than Colima. The earlier in the morning you start your hike the better, as there's a better chance of good visibility - also no cars are allowed up past 2PM. Bring change for entry to the national park - otherwise be prepared to get chocolates in exchange for change if the gatekeepers don't have change on hand. To check volcano conditions, one can peek the livecam and call Proteción Civil in Colima 1 (331) 45944, or as we suggest, secure a guide. 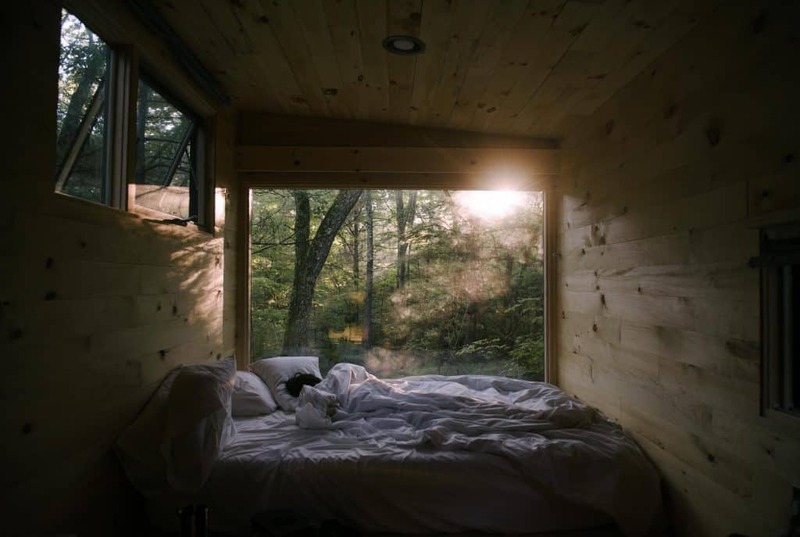 One August afternoon, Vincent and I found ourselves peering out the window of our New York tiny home, marveling at the red spruce and balsam fir trees that like other natural wonders, may not be around long enough for your grandchildren to see. While we often think of glaciers as the first victims of global warming, you don't need to travel far to see the effects. Instead, our neighboring Adirondack's spruce-fir forests, prove a worthy fighting ground for a rapidly declining community of plants and animals. With the increase in temperature and acid rain deposition, the leaves of mountain spruce-fir forests become stripped of nutrients, and as a result, are now listed at S2S3 —meaning very vulnerable to disappearing from New York. We were privileged to witness a part of natural history that is sadly overlooked by those with the power to protect these environments. In raising awareness on these issues, you can join local communities like MillionTrees, Big Reuse or Lower East Side Ecology (each of which focuses on a variety of environmental subjects: planting trees, diverting construction materials from landfills, and community-based recycling/composting programs), and volunteer to educate your peers on the importance of simple decisions you can make every day to reduce your impact on the environment. Be it finding alternatives to driving, turning off the lights when you leave a room, eating locally and reducing your meat and dairy intake, or recycling and sorting your trash — every small moment counts towards the health of our earth, which has given us absolutely everything to support our life here. Choosing to surround yourself with trees that have been around much longer than you, in a low carbon footprint lifestyle such as a tiny home, even if just for the weekend, instills within you a sense of calm and immense respect for the environment. Furthermore, disconnecting from your email, your phone calls, and the internet, and getting in touch with yourself and with your partner and understanding what it means to be present in a moment, is an immense relief for those city-dwellers that are constantly connected and in need for reevaluating their priorities. Getaway House, a company that rents minimal off-the-grid tiny homes offers just that. From the start of your experience with Getaway, you understand, that the point of it, in a simple term is — nothing. Forget your annoying iPhone alarm — the only wakeup nudge you need is from the sun. 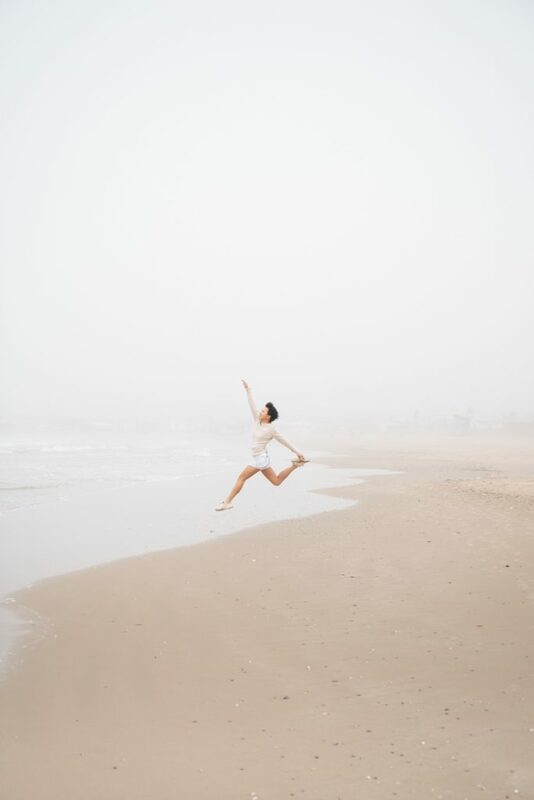 As opposed to planning out your weekend vacation, you are meant to do the opposite of what your schedule-crazy mind is telling you and instead, focus on: nothing. This is truly difficult and can be unnerving at first for the classic "I have a million things to do and a million places to be" mindset of a New Yorker but within hours you'll find yourself submitting to the slower pace of life (partially to the credit of zero cell service and Getaway House's suggested cell lock box). And hopefully, when you return from your Getaway House, you are able to apply what you have experienced from a slice of true, simple, beautiful life to your position within and outlook on modern society. 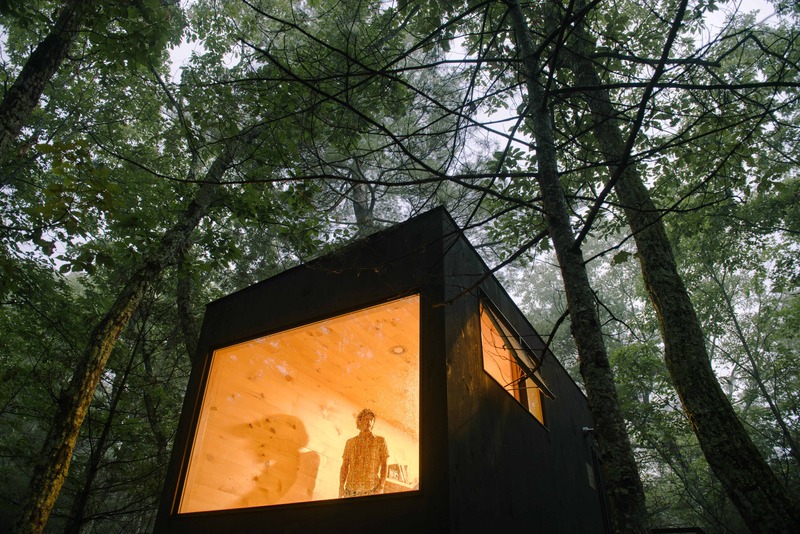 And this tiny home makes it easy with the surrounding woods and unexpected comforts of kitchenware and minty shampoo. Our take of the classic smoothie bowl with fruits, nuts, and coconut flakes brought from home. Just wake up to the chirping birds, or the wind rustling the leaves, rising from your slumber slowly to appreciate the sounds, the rest of your senses beginning to create their own awareness of nature. You see the sun's rays through the branches tickle the sheets and play orange light and shadow across the ceiling. The drumming of the morning rain lends a rhythm to your day. 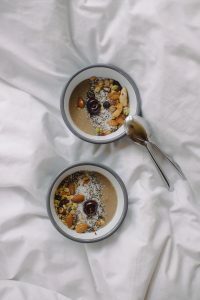 And finally, when you are ready, Getaway stocks their tiny homes with dry provisions (at a pay per use) that you can eat for a perfect breakfast in bed. Time melts away as you observe the surrounding area and wander the woods. Take in the details of the tiniest of things while sketching the outlines of bark and the back of a toad. Back in the comforts of your tiny home, browse through the books, learn about the history of the region and the adventures that took place centuries ago exactly where you are, and be architecturally inspired to create your own vision of a tiny home. Even the space-age toilet that creates foil-clad sausage-links of your waste is a phenomenon to marvel at. Lighting complimentary fire starter from another member of the Shark Tank series. We struggled for a bit, but we had the added challenge of rain drenched kindling. Memories resurface as you witness the spectacle you are a small part of. How funny to bike along the same ancient foothills that once led Rip Van Winkle to a deep slumber. As our stay in our tiny home was coming to a close, it was hard not to make parallels with his rude awakening as we imagined being thrust back into a different sort of tiny home within 21st century New York City. Could we use this time in the woods to shape how we think about the environment around us and our relationship with technology? For closure, I think about Antoine de Saint-Exupéry, whose respect for both nature and machines was not of paradox, but in response to what he saw as two forces that guided awareness of each other. But how can anyone conceive that the machine is an end? It is a tool. As much a tool as is the plough. The microscope is a tool. What disservice do we do the life of the spirit when we analyze the universe through a tool created by the science of optics, or seek to bring together those who love one another and are parted in space? It was only yesterday that we began to pitch our camp in this country of laboratories and power stations, that we took possession of this new, this still unfinished, house we live in. Everything round us is new and different - our concerns, our working habits, our relations with one another. Our very psychology has been shaken to its foundations, to its most secret recesses. Our notions of separation, absence, distance, return, are reflections of a new set of realities, though the words themselves remain unchanged. To grasp the meaning of the world of today we use a language created to express the world of yesterday. The life of the past seems to us nearer our true natures, but only for the reason that it is nearer our language. The end goal isn't to banish technology and retreat into a hermitage in the woods. Getaway House's tiny home strips us of all distractions, giving us the time and space to examine the natural world around us and our relationship to it. Can we challenge ourselves to use the tools we're most familiar with as a means for ecological responsibility? This will be the question I ask myself as I leave this home for another. Thank you for reading. Words by Vincent Ribeiro and me, photos from the two of us. We're grateful for Getaway's accommodations & Artist Residency to facilitate this post. As always, our opinions are our own. Check out Getaway House for your chance to recharge in the woods near New York City & Boston. Traveling at your own pace allows you to soak up all the sights and grants you the freedom and flexibility for spontaneous detours. 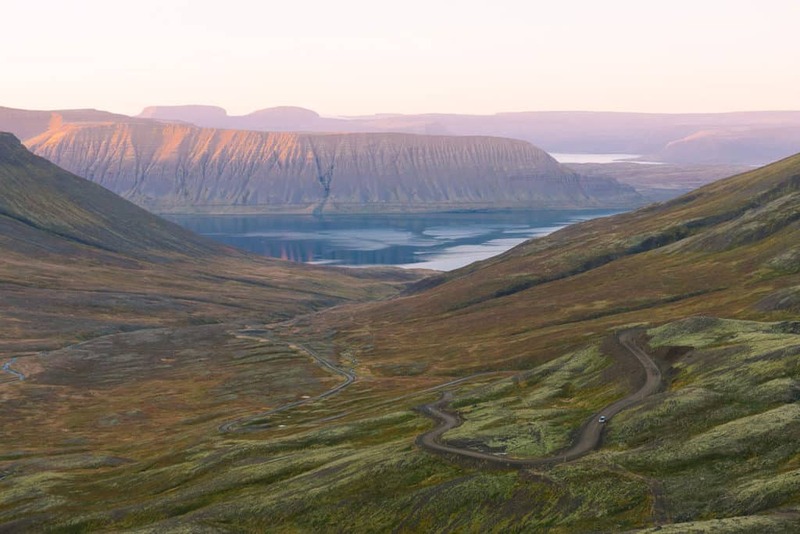 The famous Ring Road is the most direct way to road trip around Iceland (~832 miles), but we'd argue there's much to see along local roads and winding fjords. Relish the endless Olís gas station coffees (get the discount card) and make the time for the numerous hot springs you'll pass along the way. Below, are (1) general FAQs answered (2) places of Interest we mapped out for our trip (3) and a quick language gloss for the nature lover. The most cost-efficient car-rental options we found were Cars Iceland and Blue Car Rental. 2WDs are a fine option if you plan to stick to the ring road, however; if you plan to take some more unruly roads a 4WD is the way to go. You also have more cost-efficient options if you know how to drive stick shift! July - August is a popular time to visit Iceland thanks to the sun and warm weather. The downside is steeper prices and more tourists. Shoulder season, September - October has the benefit of off-season rates, fewer people, but comes with greater colder and windier. Many of the campsites are closed during this time (though still accessible). For us, visiting mid-September offered a great balance between daylight hours, aurora sighting, hiking & camping accessibility, and staying within our budget. However, we were definitely cutting it close with a lot of the longer hiking trails that tend to close past early October. Winter road tripping comes with its own hazards. We've heard harrowing stories from locals about how snow and lack of visibility led to close calls. More preparation and planning is definitely required. Vegagerdin is a useful site to consult, as it keeps road conditions updated. While, Vegasjá provides a more in-depth view with live webcams and colored indicators that show how many cars have accessed the road. Our host generously lent us his Kortabók Iceland Road Atlas , which turned out to be a great travel companion that encouraged us to venture beyond ring road. 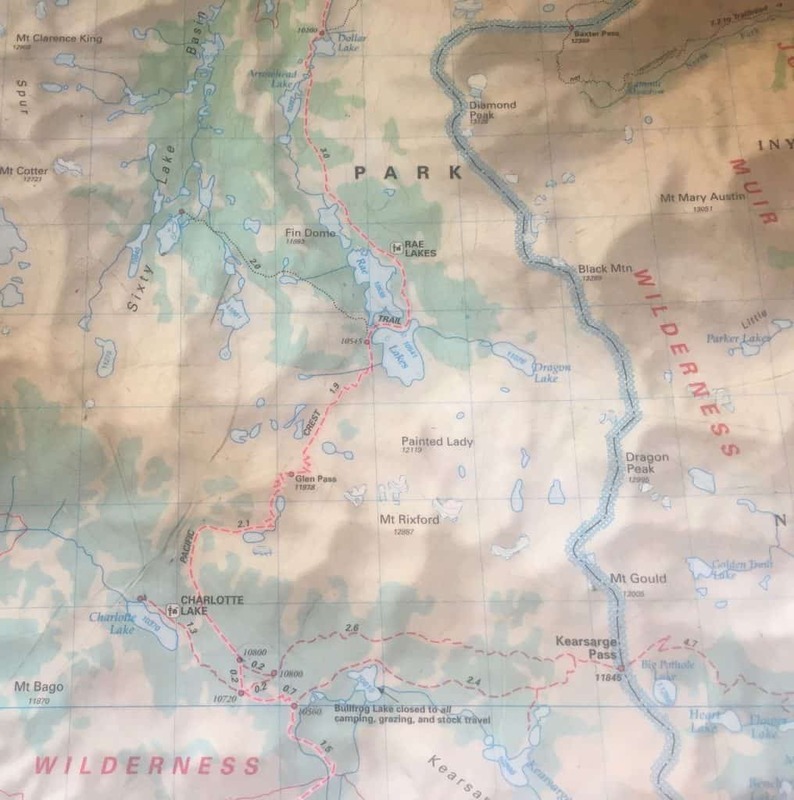 The maps (scaled at 1:300,000) are detailed with topography and intriguing points including abandoned farms, waterfalls, hot pots, and camping grounds. The latter half of the book has camp-site, swimming pool, and museum-specific maps for the entire country – something extraordinarily helpful for finding last-minute camping spots without wifi. Pin symbols correspond to: hikes, camping sites, natural sights, hot springs, churches, restaurants, & points of interest. Clicking the top left icon allows you to filter the categories & see the POIs in list view. Luckily, Iceland is one of the countries you can download an offline map from Google Maps. *Note access to some of the destinations are season-dependent. In the spring, farmers release their sheep into the wild to graze and roam. It's not uncommon to find sheep wandering in the most extreme of places. While hiking Fimmvörðuháls, we saw some precariously perched on craggy rocks that looked impossible to ascend or descend, while we found another that had unfortunately lost its footing and careened down to the bottom of a canyon we were hiking through. In Iceland, Fall brings the dangers of extreme weather and malnourishment, so the farmers make a collective effort to bring the sheep home, painstakingly tracking them down by horseback and by foot. Running after the sheep is actually a job you can volunteer for on workaway, if you have sturdy legs and lungs. Each farm is required to contribute volunteers relative to their farm acreage. After all the sheep are brought back, they are sorted back to their original farms based on the tags on their ears. Sheep we encountered in Borgarfjörður Eystri. After a whole spring and summer of roaming, the furthest a sheep goes is within 3 days worth of horseback riding. As we drove along the northern fjords, we found that the same goes for the famous Icelandic horses. 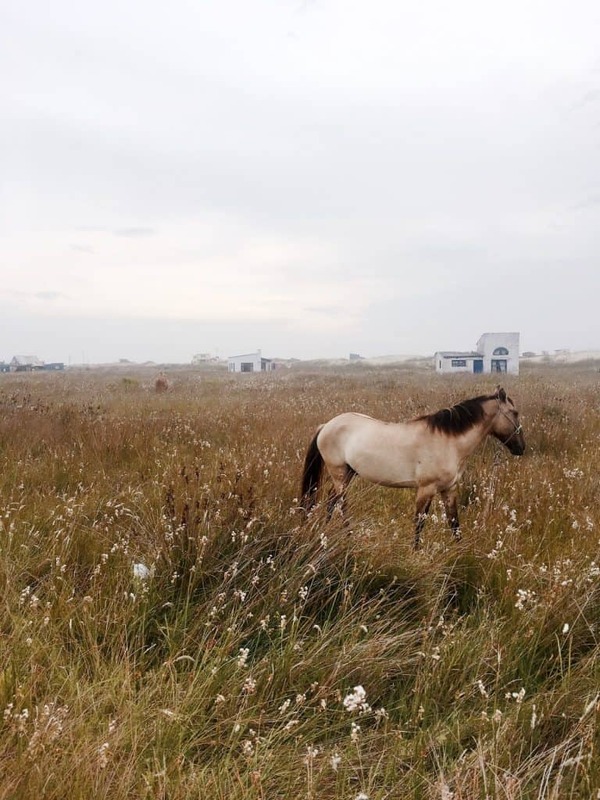 After pulling out of Hofsós, we came across a group of horseback riders who invited us to try their spirit of choice, hot chocolate and Icelandic alcohol, and take a closer look at the horse roundup. The horses from the valley shifted impatiently in the temporary corral, having grown unfamiliar with confinement. They had been sorted by farm earlier in the day, and the farmers were ready to bring them home. They burst out when the gates were opened and a young teen rider led the team of horses towards their farm. Impressively, the horses followed in an orderly fashion. Punkish manes to butts to shaggy mops to butts to luscious locks. Until one horse broke out from the team, giving rise to an intense chase and eventually a reluctant return to the herd. Skagafjörður's annual horse roundup is especially impressive, considering it's the only county in Iceland where the horses outnumber the people and famous for its horse breeding and training. The horse roundup brings together all the farms in the valley, and usually wraps up with generous libations and singing, while we were generously invited to join, we had to politely decline and drove to meet our hosts on time, just a few blocks away from the post-roundup festivities. 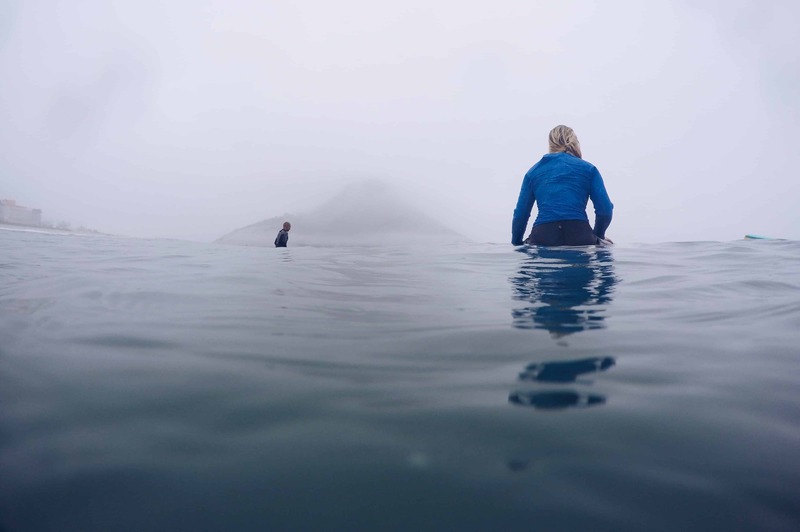 Finding solitude in Iceland is more difficult than it sounds. 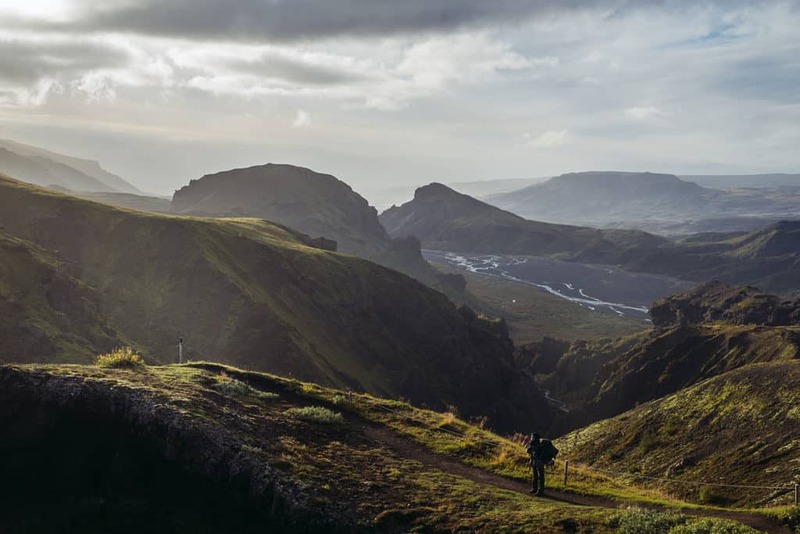 While we're fed a steady stream of Iceland images that seem to be set in the remote wilderness, many of the famous sights and waterfalls are within 5 minutes walk of a parking lot or constantly inundated with selfie-stick wielding tourists. At times you even start to run into tourists – funny for an island that's 39,769 mi² (roughly the size of Maine). One man even remarked to me, "I can't escape the drone! I've been to three sites and the man flying the drone always turns up!" Accessibility to natural sights is totally underrated – so I'm glad Iceland does a great job of it. However, for those who are looking for some more solitude it often means spending a bit more to rent a 4WD to get into the highlands or strapping on hiking boots. Being on a tight budget, we opted for the latter. We seized the opportunity to go on a long hike after finding out we had a rare Autumn day of 100% sunshine coming up on via vedur. 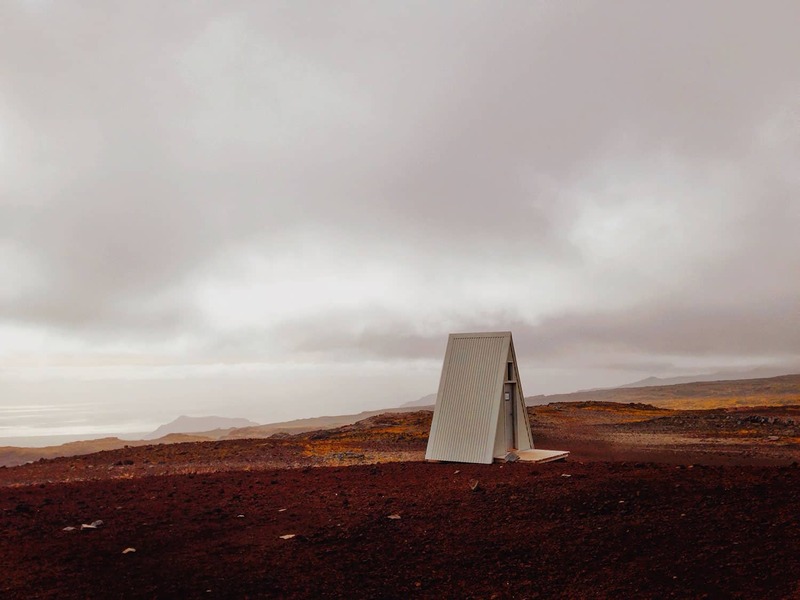 Our spur of the moment ambition to hike to Þorsmörk, led to some frantic mobile phone research, while pressed against a closed wifi-emitting booth at 11 PM the night prior. We ditched the idea of hiking there from Seljalandsfoss, and opted for the more conventional Fimmvörðuháls trail (aka Five-Cairn Trail) that starts at Skógar. Can you drive there via 2WD? No. Only 4WDs. 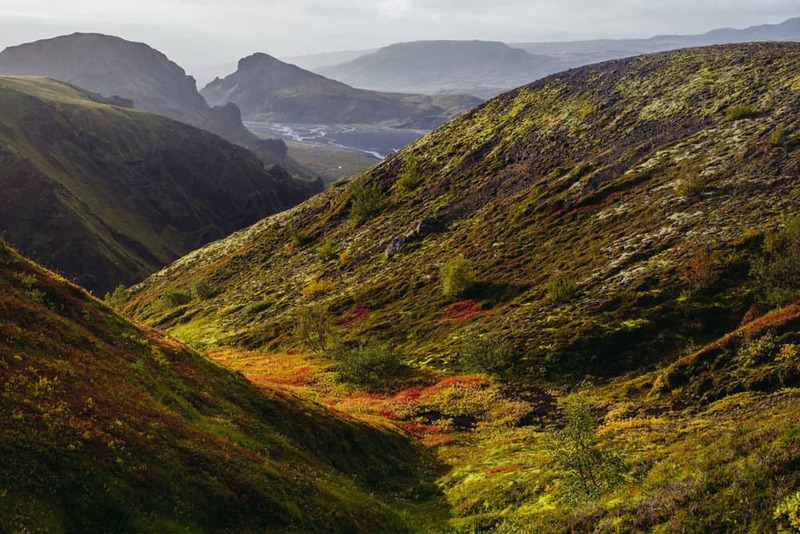 There is the option to bus to Þorsmörk without the hiking, or bus back after one-way hike (runs from mid-May to mid-October). You can leave your rental car in the Skógafoss public parking lot for free. How long is the hike? The Fimmvörðuháls trail is 25km long (estimated 9-11 hour hike), but it depends on your end destination (see 'Where do I sleep'). Altitudes reach over 1,100 m. We did it in one day, but some prefer to split it into a two day hike. Is the trail easy to follow? It's a popular trail, and it is neatly marked with wooden poles, which become tall yellow poles when you reach the glaciers. With good visibility, we had no problems, however; fog can complicate that. You may have difficulty with wayfinding when the ice on the glaciers build up and decrease the visibility of the yellow poles. When does the trail close? This is dependent on the weather. We hiked it at the end of September, some people say ~ October is when it should be off-limits for hikers. Be sure to confirm the trail status with locals establishments. Check out Ultvist's recommendations. Rain, snow, and high winds are not uncommon, even in the summer, so be sure to be prepared! Listed by distance: There are two no-frills huts around 16km and 20km into the trail. These huts are small and require booking in advance (and are usually only open mid-June to mid-October, ~65000 ISK). Near the end of the trail into Þorsmörk, is the campground Básar (24km in, N63°40,559 / W19°29,014). Next would be the lodge Skagfjordsskali (28.3km in, 63°40.960 / 19°30.890), and the fanciest for last – Volcano huts (30 km in). You're not allowed to camp off the trail, however; use your judgment if you find yourself in an emergency situation. Fimmvörðuháls was perhaps the most demanding, yet subliminal hikes I've ever done. 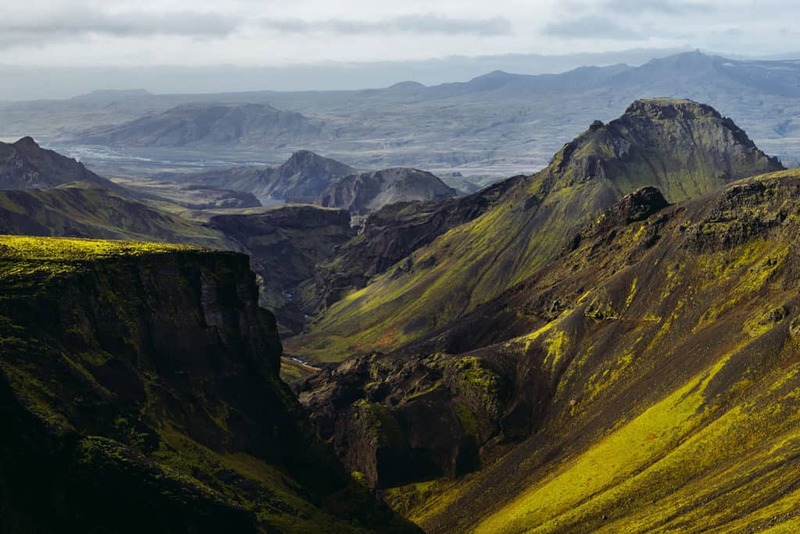 You start by climbing to the top of Skogafoss and for some time, you can slake your thirst with glacial run-off that's tumbled down the numerous waterfalls you'll encounter. Then incredible wind. 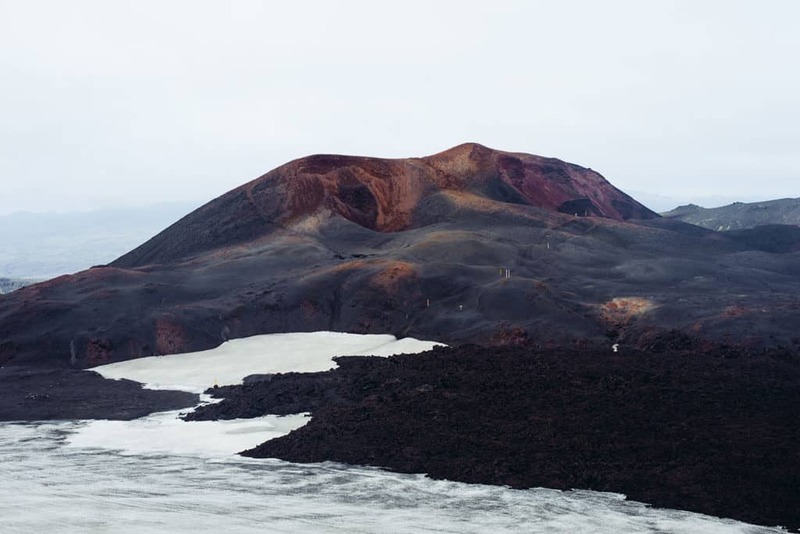 The scenery transforms into otherworldly hues, as you pass Magni and Móði – spawned by Eyjafjallajokull's 2010 eruption. Outhouse of the newly rebuilt Baldvinnsskali hut. 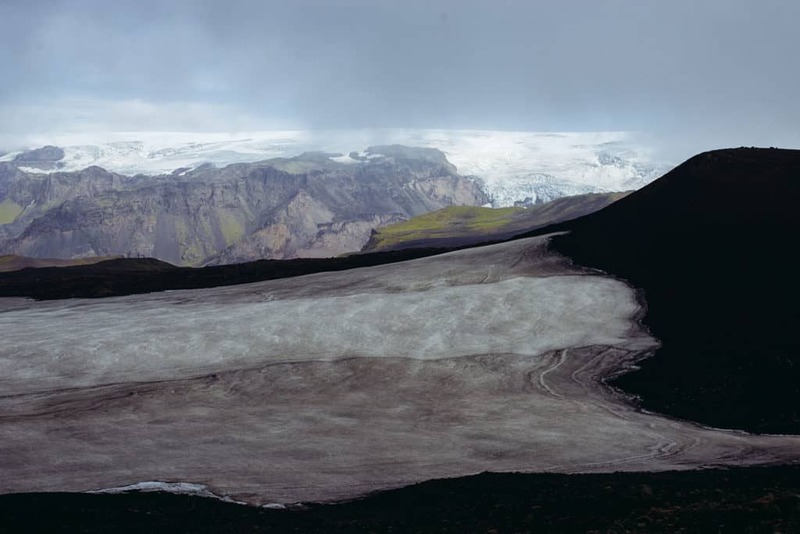 Móði and Magni, the two new craters that emerged from the Eyjafjallajökull eruption. 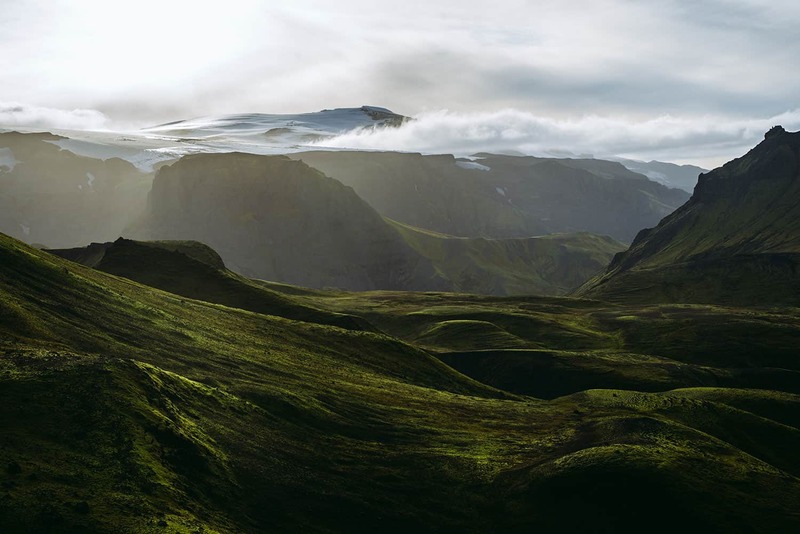 A monochromatic landscape dramatically opens into the lush vista of the Land of the Gods (Goðaland). The river(s) in the distance is the one you would have to cross with your vehicle to drive into Þorsmörk! Cat’s Spine (Kattarhryggi) calls command of heights, with a real risk of teetering off the either side of the ridge. It's flanked by velvety hillocks and a craggy primordial landscapes. By the end of Fimmvörðuháls I was definitely on auto-pilot, footslogging my way through due to dehydration (eat sodium-heavy camp food in moderation), though the intoxicating feeling of drifting between planets and fiction is something I'll remember for a lifetime. We reached an eerily empty Básar at the end of the hike – and as if on cue, the sun set behind the mountains. Soccer nets and burnt campfires seemed frozen by the arrival of autumn, however; fresh bananas in the trash and an up-to-date weather report hinted live habitation. What looked like complete abandonment of the site meant we had our top pick in terms of camping spots. We got to work setting up our tent and cooking ramen and ginger tea for the night. Despite our minimal packing goals, at the end of the hike, I realized that John McPhee’s The Control of Nature hitched a ride in my backpack. Luckily, the stories of how humans have made foolhardy, cartoonish, and sometimes "successful" attempts to tame nature made for the best tent read-aloud. The chapter Cooling the Lava, an epic hail mary involving dedicated manpower and puny water hoses to stop lava from reaching an Icelandic harbor, seemed fitting to read while nestled in the shadow of Eyjafjallajokull. Photographs by Vincent Ribeiro and Jocelyn Chuang. Other great resources that cover hiking Fimmvorðuháls can be found at Spice & Dice, Iceland for 91 days, and Alex Buri's write up on KimKim. Learning how to surf in Recreio dos Bandeirantes with the wonderful team at Rio Surf n Stay.